The Northeast has many 4,000-footers—115, to be exact. New Hampshire and New York—each with 48—feature the region’s dominant ranges. Even Maine, known for rocky Katahdin, has 14 of these peaks. So, it would be easy to overlook Vermont, with just five summits over 4,000 feet. But, if you weren’t paying attention, you’d definitely be missing out. 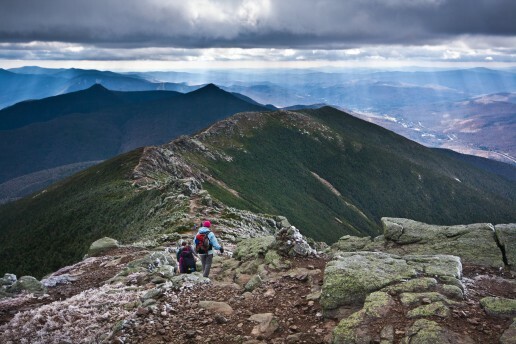 Short hikes, challenging trails, and amazing above-treeline views of Vermont, New Hampshire, and New York make the Vermont 4,000-footers some of the Northeast’s best-value hikes. Named after the 16th President of the United States, Mount Abraham is the shortest and “easiest” of Vermont’s 4,000-footers. Luckily, this stunning peak doesn’t need a superlative elevation to attract all types of hikers. Rather, its moderate terrain and fantastic summit views entice almost everyone. 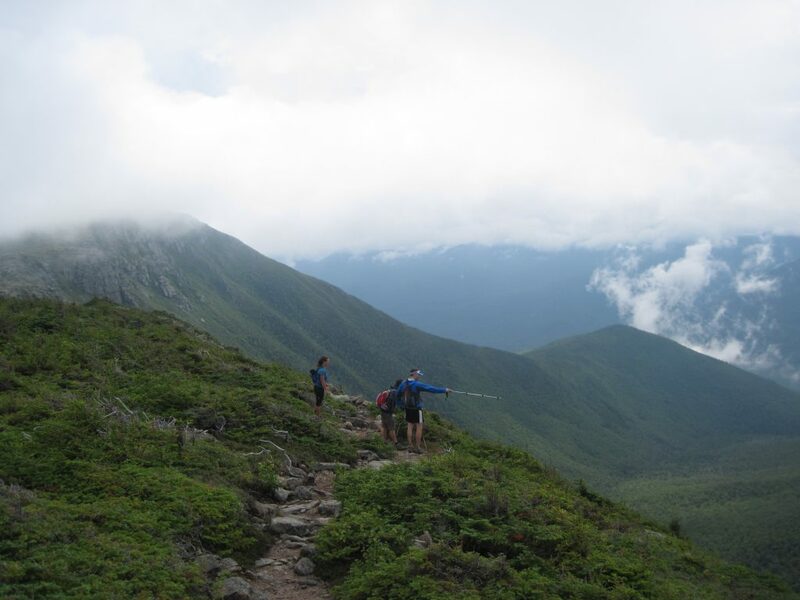 In addition to its hiker-friendly trail, Mount Abraham delivers all kinds of walk-worthy views, with Mount Ellen looming on the ridgeline to the north, and the Green Mountains, the Adirondacks, and the White Mountains on competing horizons. Leaving from the appropriately named Lincoln Gap Trailhead, hikers will follow the Long Trail for roughly 2.5 miles while gaining 1,600 feet in elevation on the trek to the summit. Along the way, hikers will experience a mostly smooth and obstacle-free trail, with a few strenuous sections as it gently picks up elevation. At 1.7 miles, hikers will encounter the Battell Shelter, both a favorite overnight stop and a nice place to sit down and have a snack, if you’re looking to go up and back in day. Hikers looking for an extra adventure and a different type of view can find the remains of a 1973 plane crash just past the summit on a herd trail located further down the Long Trail. Despite being the only Vermont 4,000-footer to have its summit in the trees, don’t overlook hiking Mount Ellen. Thanks to a great vista when it intersects with the top of Sugarbush Resort, the hike is not without views. And, with impressive ridgeline hiking along the Long Trail, Mount Ellen delivers comparatively unique terrain. Hikers will leave on the Jerusalem Trail from Jim Dwire Road and follow it for 2.4 miles, before it connects with the Long Trail. Along the Jerusalem Trail, it’s easy to get lost in your thoughts and marvel at the web of tubes woven for maple sugar collection. Once on the Long Trail, hikers will follow a ridgeline section as it climbs up and down before reaching the 4,017-foot-tall summit and having cumulatively gained 2,600 feet in elevation. Fit hikers, looking to bag two 4,000-footers and sample part of the Long Trail’s “Monroe Skyline” section, should stash a car at either the Lincoln Gap or the Jerusalem Trail and hike Mount Abraham and Mount Ellen together. From either summit, simply follow the Long Trail across this excellent ridgeline stretch while taking in the views and enjoying what many consider to be a classic section of the Long Trail. The almost-11-mile hike covers mostly moderate terrain and also takes you across Lincoln, Nancy Hanks, and Cutts Peaks. 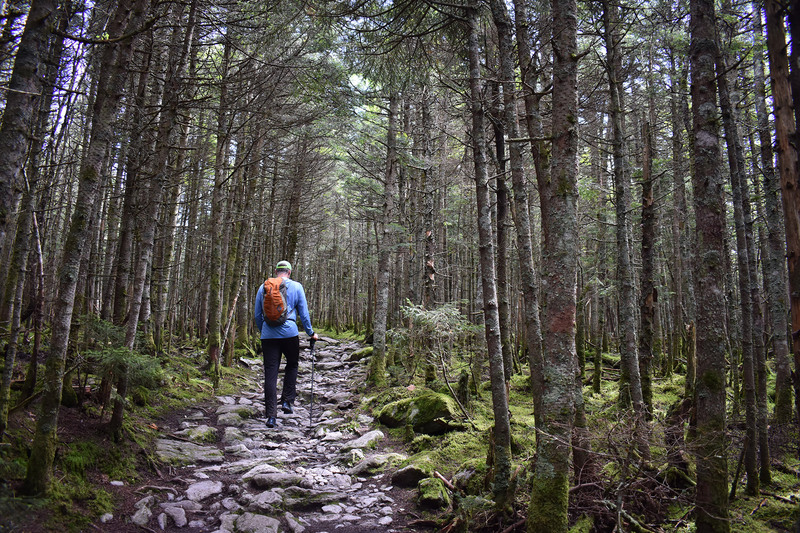 Ascending Killington via the Bucklin Trail is a great, moderate way to tag Vermont’s second-highest summit and the tallest spot on the state’s portion of the Appalachian Trail. Most can hike it in half a day, and it crosses two iconic thru-hikes, the Long Trail and the AT. At the top, Killington delivers outstanding 360-degree views and is a must-visit spot for any dedicated New England hiker. Hiking 7.2 miles round-trip and gaining a little over 2,500 feet in elevation, those used to spending time in the Whites or the Adirondacks might be surprised by how quickly they’ll be able to dispatch this peak out-and-back, thanks to the modest terrain—that is, if they can avoid lingering on its lovely summit. Leaving the Brewers Corner parking lot in Mendon, hikers will follow the gentle Bucklin Trail for the first 3.3 miles, before connecting with the Long Trail/Appalachian Trail for the steep and scrambly summit push. Depending on the day, your summit experience will vary. From the summit proper, a few manmade structures in the distance are easy enough to put at your back and ignore as you look out to Pico Mountain from the open summit slabs. However, on busy days when the Gondola is running from Killington, expect to share the summit with other hikers and non-hikers. Regardless of the crowds, you’ll get plenty of views of the Green Mountains, Adirondacks, and Whites. At just under five miles round-trip, hiking the 4,083-foot-tall Camel’s Hump—Vermont’s third-tallest mountain—via the Burrows Trail is a great option for a morning or afternoon. The impressive alpine zone hiking and the treeless summit’s vast 360-degree views, including an awesome perspective of the Green Mountains and Lake Champlain, make this a must-do. On a clear day, hikers can even see as far west as the Adirondacks and as east as Mount Washington. To begin, access the Burrows Trail at the end of Camel’s Hump Road. You’ll find that the trailhead is easy to spot at the back of the parking lot. In spite of its relatively short length, the Burrows Trail packs a punch. To the summit, attention-demanding rocks and roots characterize its just-under 2,000-foot climb. Just before the summit, the Burrows Trail intersects with the Long Trail at a clearing. Here, think about getting your wind shirt, hat, and gloves ready—and maybe even a puffy coat on cooler days. As you head above treeline and onto the Hump proper, you’ll find that temperatures quickly change. Also, when descending, take an extra second at the clearing to make sure you’re heading down the right trail. At this spot, it’s easy to be excited by the summit views and accidentally go the wrong way. Camel’s Hump is an amazing and challenging hike that can be accomplished with plenty of time left to explore Burlington and Stowe, both of which are nearby. But, because this peak can get busy and the parking lot packed, start early, or be prepared to share it with others. 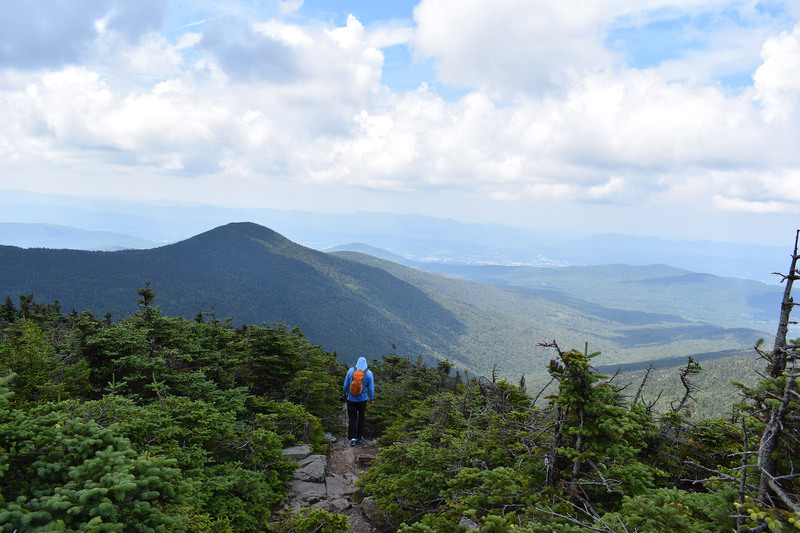 Another one of Vermont’s iconic 4,000-footers, Mansfield is the tallest, most northern, and arguably the most difficult peak here, and is a must-do for any Northeast hiker. When viewed at a distance, Mansfield’s ridgeline resembles a human head, and its various high points are named after such distinct features: the Forehead, Nose, Chin, and Adam’s Apple. To get to the true summit, the Chin, follow the Long Trail South’s white rectangular blazes beginning on Mountain Road (Route 108) just past Stowe Mountain Resort. Approximately five miles round-trip, the hike begins moderately on relatively smooth trail. About 1.5 miles in, the Long Trail becomes rockier as it approaches the Taft Lodge, where hikers stay overnight either on the way to the summit or as part of a longer outing. Around the lodge, hikers also get their first glimpse of the Chin through the trees. After passing the lodge, the Long Trail approaches treeline, gaining elevation quickly over 0.3 miles to the junction between the Chin and the Adam’s Apple, one of Mansfield’s many sub-peaks. At the junction, follow the Long Trail South to the left, for a memorable climb up the final 0.3 miles of alpine ridgeline to the summit proper. But, be careful. The ridgeline is very exposed to weather, and a couple segments involve some scrambling. On the summit, enjoy the alpine flora and the 360-degree views. The view west towards Burlington, Lake Champlain, and the Adirondacks is outstanding, especially near sunset. But, if you stay that late, try not to linger too long, as the scramble back to the Adam’s Apple junction can be treacherous in the dark. As one alternative, try to view the sunset from the Adam’s Apple, which has a similar feel without the exposed descent. It’s been said many times that “trad is rad.” But, figuring out what you need to get started in traditional (or “trad”) climbing can be difficult. With that in mind, we have developed this checklist, so you can begin building your multi-pitch kit and get out there. Stoppers—sometimes referred to as nuts or chocks—are a great place to start for beginners looking to build their racks and learn the finer points of placing gear. Named after the machine nuts British climbers slung to protect their climbs, today’s iterations are much more advanced, with some being developed with special shapes for specific applications. Climbers place them in the rock’s constrictions, and when loaded, like in the event of a fall, they remain wedged in to protect the climber. Beginners may want a complete set, like the Black Diamond Stoppers, which include 10 ranging in size from 4 to 13. Most rack their stoppers on one or two non-locking biners. Although they’re a bit heavier, we like to rack ours on traditional oval biners, like the dependable Black Diamond Oval. Doing so makes it easy to pull on the carabiner to help set the nut. For those unfamiliar, this means tugging in the direction from which the nut might pull, thus making it less likely to shift. Although numerous manufacturers produce camming units, or simply cams, Black Diamond Camalot C4s are the standard. Most will want these starting at size 0.3 and ending at size 3. A set of C4s along with a stopper set should provide enough protection to safely ascend many introductory trad routes while giving climbers an opportunity to assess what else they might need. Most rack their cams on individual, non-locking biners. For the super-organized, many companies make color-coded ones to match the cams, like the CAMP Photons, making it easier to find and grab the one you need off your harness. Alpine draws—specifically, dyneema slings with two carabiners doubled into a quickdraw and used to connect gear to the climbing rope—offer incredible versatility. You can use them as a standard quickdraw, or extend one to reduce rope drag on wandering routes or to lessen the rope’s pull on placed gear. Having between 10 to 12 alpine draws is a good starting place. You can either make them yourself by buying individual slings and biners, or get them pre-configured, like the CAMP Mach Express Dyneema. Depending on where you climb, you’ll want to supplement this basic rack with gear appropriate to where and what you climb. One of our favorite rack supplements, micro cams work for smaller, tighter-fitting placements. We both are fond of Black Diamond’s Camalot C3s and X4s and routinely carry C3s in sizes 1 and 2 and X4s in sizes 0.2 and 0.4. Getting multiples of some cams is also a good idea. For example, climbers who frequent the Gunks (or other areas where not every anchor is bolted) might want to double-up on popular cams like the 0.5, 0.75, and 1. Similarly, climbers heading to Indian Creek may want to get several of the same size due to the cracks’ uniform nature. Climbers going to Whitehorse or other Northeast slabs should also consider adding a few tricams. This somewhat-hybrid tool can be placed passively like a nut or actively like a cam, and, featuring slings instead of stems, may substitute spring-loaded cams in horizontal cracks. Their unique shape often makes them the best way to protect slab climbs featuring small pockets. A well-worn Pink 0.5 Tricam, for instance, can be found on many a Northeast climber’s rack. Finally, climbers anticipating leaving gear for rappel anchors should consider adding a few extra stoppers. Nuts are much less expensive, so the pain of leaving a few behind to build a bomber anchor won’t have you skimping on safety. For any route where you’ll be belaying from the top of the pitch and later rappelling, consider a multi-purpose belay device with assisted braking, like the Black Diamond ATC-Guide or Petzl Reverso 4. Although these cost fractionally more than a traditional model, they are far more versatile, allowing climbers to belay a leader from the bottom, top-belay two seconds simultaneously with assisted braking, and make full-length rappels. We carry ours on a dedicated large, locking biner, like the Petzl William Screw-Lock. When climbing as a party of two (or of three in caterpillar style), we often bring along a Petzl GRIGRI. Although some consider this excess weight, we like it because it expands our raising and lowering options and, equally important, makes top-belaying much, much easier. If your arms and shoulders have ever gotten more of a workout top-belaying a second with an ATC-Guide-like device than from the actual climbing, you’re probably already a convert. A good nut tool, like the Black Diamond Nut Tool, is a small investment that pays for itself. It makes removing protection placed by the leader easier, and helps ensure you finish with all the gear you began with. As an added bonus, some have built-in bottle openers for post-climb beers. Along with the locking biner for the belay device, we each carry three to four additional locking biners, especially on multi-pitch trad climbs. You can attach them to the anchor, connect them to a rappel back-up, or pair them with your ATC-Guide or Petzl Reverso to belay a second in “guide” mode. Another fantastic tool, a hollow block, helps with backing-up rappels or lowers, ascending the rope, or building a haul system to aid a struggling second. It handles nicer than the traditional prusik cord and is also easier to work with. Used for building an anchor at the end of a pitch, a cordellette is a length of a 7mm or 8mm cord tied in a loop using a double fisherman’s knot. Trad climbers planning on multi-pitch routes generally carry two to three per rope team. It’s crucial that aspiring trad climbers find a harness that racks the gear while still being comfortable. An all-around model with two gear loops per side makes a solid starting point. These offer enough padding for all-day comfort, with enough gear loops to accommodate the equipment needed for a multi-pitch route. We’ve both enjoyed using the Black Diamond Aspect Harness. But, fit is personal, so visit your local shop and try a few before you buy one. And, make sure you feel no discomfort. A little pinch or rubbing in the store only gets worse as the hours tick by on your first multi-pitch route. While many choose to rack their gear on their harness, some EMS Climbing School Guides swear by their gear sling. It takes the weight off your hips and keeps harness-bound cams from obstructing your view of your feet. 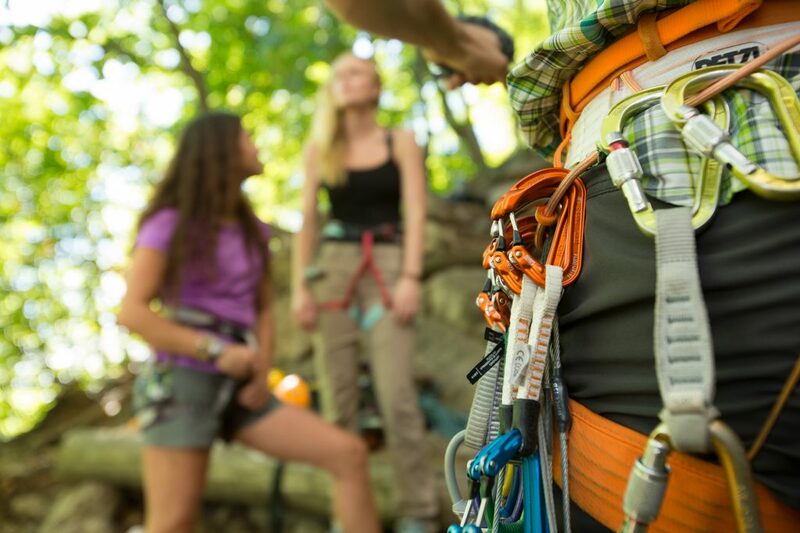 Climbers can choose between using slings designed specifically to hold and organize your gear, like the Metolius Multi-Loop, or using a climbing-rated nylon model that can be repurposed if need be. 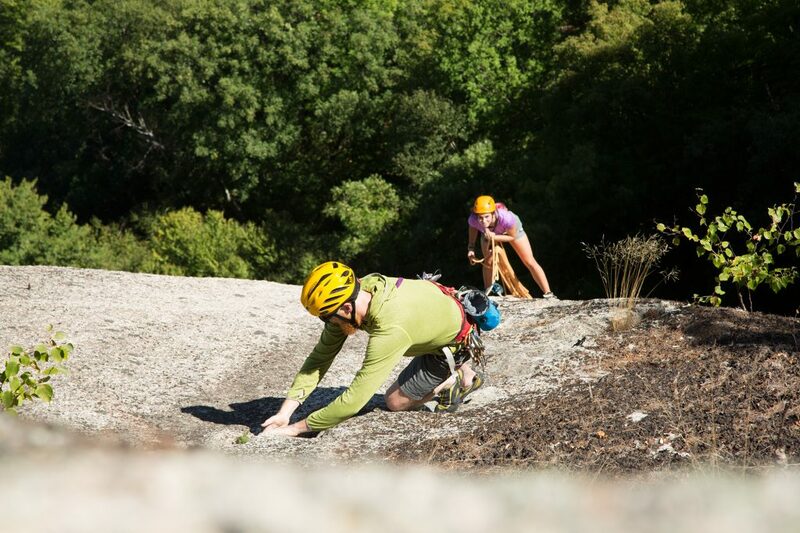 If you’re going trad climbing, you should plan on wearing a helmet. Whether it’s people climbing above you, gear handling, the occasional loose rock, or exposure, your head is constantly under threat. Today’s are light, breathable, and relatively inexpensive. Buy one before going out to the crag to keep your head safe and to avoid looking like a newbie. A favorite of ours is the Black Diamond Vector. The climbing shoes best suited for multi-pitch trad climbing tend to be more comfortably shaped and have a looser fit than those for other climbing disciplines. Introductory trad climbers should avoid the pointed toes and aggressive downturns found in many of today’s sport climbing and bouldering shoes, opting for one that can easily be stuffed into cracks, smeared on slabs, and, most importantly, worn for extended periods of time. Consider investing in a multi-pitch pack, ideally one with room for water, snacks, a guidebook, or topo, and built to withstand the activity’s rigors. The Black Diamond Speed 22 is a longtime favorite of ours. Water bottles can be hard to access and easy to drop. Thus, make sure your pack holds a hydration bladder. It’s surprising how much cooler it becomes once you get a rope length or two off the ground. A lightweight and packable windshirt, like the Mountain Hardwear Super Chockstone, not only helps fend off a chill, but also stands up to rubbing against rock. Make sure to bring the guidebook, so you don’t waste time looking for a route. On multi-pitch routes, we’ll photograph the relevant approach information, route description, and topos on our phones and leave the book in the car or at the base. Time can get away from you during a long day. A small headlamp like the Black Diamond ReVolt (just remember to keep it charged) and a couple of energy gels stashed away might save you. Use this list when assembling your rack, and you’ll be well on your way to enjoying the freedom, fun, and fear that come with trad climbing. Is there a piece of trad gear you can’t live without? We want to hear about it! Leave us your recommendations in the comments. This Northeast classic is one of the region’s most sought-after trips, and for good reason. The Presidential Traverse is one of the most challenging and beautiful point-to-point hikes in the Whites, and the Northeast at large. It summits up to eight of New Hampshire’s 4,000-foot mountains—including the five tallest in New England—with the most notable being the iconic Mount Washington. Because most of the hiking occurs above tree line, hikers can expect a day full of incredible views…if the weather holds, that is. Most begin the Presidential Traverse at the Appalachia Trailhead and end at the AMC’s Highland Center Lodge in Crawford Notch. Doing the Presidential Traverse from north to south is easier, as it gets the majority of the elevation gain out of the way early in the trip, while leaving smoother, easier trails for the end. If you have two cars, leave one at each trailhead. If not, take advantage of the shuttle service provided by the Appalachian Mountain Club. Getting to the Appalachia Trailhead from Interstate 93 is straightforward. Follow I-93 to exit 35, US 3 North. Stay on US 3 North for 12 miles to NH 115 North. After roughly 10 miles turn right onto US 2 East, follow it for a little over 7 miles, and the Appalachia Trailhead will be on your right. If you’re coming from the Route 16, follow Route 2 West for 5 miles west after its juncture with 16, and look for it on your left. Depart Appalachia on the Valley Way Trail. Although the trail’s start is easy to find, an early morning and a maze of trails leaving Appalachia can make it a careful task to ensure that you start—and remain—on the Valley Way Trail. Otherwise, you’ll spend the morning trying to get back on track. The Valley Way Trail is initially moderate, but gets progressively steeper as you approach Madison Spring Hut (44.328037, -71.283569). There are numerous trail junctions throughout the trail’s 3.8 miles, but all are well-marked. After 3.1 miles, you will pass the Valley Way Tentsite, one of the few designated camping areas along the Traverse. From the tent site, you will get occasional glimpses of Mount Madison looming above on your left as you close in on the AMC’s Madison Spring Hut. Overall, the Valley Way Trail gains 3,500 feet of elevation—more than a third of the trip’s total—over 3.8 miles. Equally important, it stays below treeline until the hut, allowing you to get in some miles without being too concerned about the weather. From Madison Spring Hut make the one-mile roundtrip dash on the Osgood Trail to the summit of Mount Madison (44.328846, -71.276688). Don’t be fooled by the relatively short distance to the summit and back, the Osgood Trails is rugged and steep, gaining 550-feet of elevation. On top of Madison—the Traverse’s first 4,000 footer—take in the inspiring 360-degree views, highlighted by Mount Washington to the south, and your next objective, Mount Adams. However, don’t linger too long before heading back the way you came to the hut, there is still a long way to go. Back at the Madison Hut refill your water, scrounge for leftover breakfast, or buy baked goods. On a big trip like the Presidential Traverse (especially if you’re doing it in a day) every minute and ounce counts. Since the route after the hut is above treeline for the next 12 miles, the hut is also a good place to reassess the weather. If it is deteriorating, considering bailing here, before the turnaround logistics get too complicated. Mount Adams (44.3203, -71.2909) is the next summit on the Traverse. To get there from the hut, follow the Gulfside Trail to the Airline Trail. It is a 0.9 mile trip, gaining 950-feet of elevation up rocky and rough terrain. 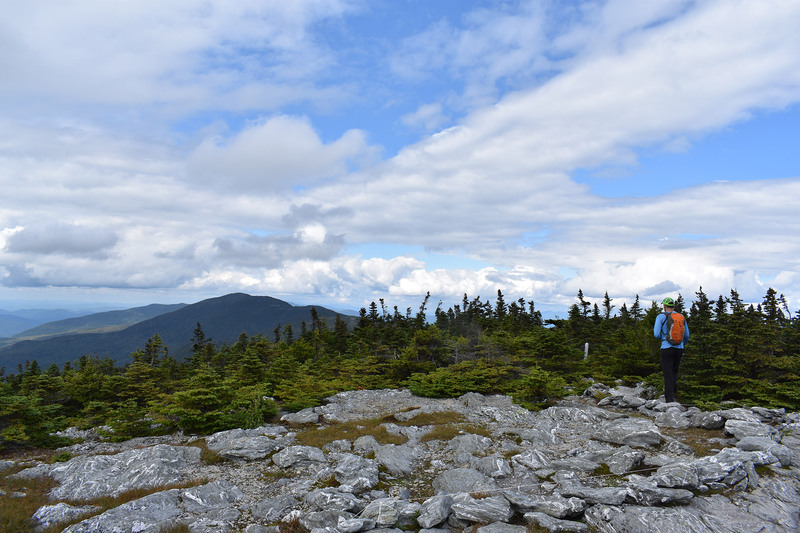 From Adams—the second highest mountain in New England—enjoy dazzling 360-degree views of Mount Madison and Star Lake behind you, and Mounts Jefferson and Washington before you. From Adams, drop down 0.3 miles through a boulder field to Thunderstorm Junction and rejoin the Gulfside Trail. After 1.2 more miles hiking alongside the Great Gulf, you’ll be longing for smooth trail by the time the Gulfside reaches Edmunds Col. Unfortunately, the 0.6 mile-long hike on the Jefferson Loop Trail across Jefferson’s summit (44.304237, -71.316597) is anything but smooth, climbing 800 vertical feet in some of the most challenging hiking yet on the Traverse. Warning: False summits abound on the way to the actual summit. Jefferson—the third highest mountain in New England—doesn’t disappoint on views. Take a moment to enjoy them, with Mount Adams behind you and Mount Clay and Mount Washington towering before you. Once you’ve had your fill, continue south along the Jefferson Summit Loop until it rejoins the Gulfside Trail. Before you leave the summit though, evaluate the weather, mindful of how much exposed hiking is left. If you have any doubts, from here there are numerous trail options that will bring you back to your car at the Appalachia Trailhead, albeit with some difficulty. One way back is to backtrack the Jefferson Summit Loop Trail and connect with the Gulfside Trail. Follow the Gulfside Trail for 0.7 miles to the Israel Ridge Path which you will take for 0.8 miles to the Perch Path. Hikers will want to follow the Perch Path for a short distance—passing the Randolph Mountain Club Perch Shelter—before connecting with the Randolph Path. Backpackers might want to stay the night at the Perch Shelter and try and wait out unfavorable weather, or give themselves an extra day before making the long 6.1 mile trek along the Randolph Path as they drop 3,700-feet in elevation to the Appalachia Trailhead. The Perch Shelter costs $10 (for non-Randolph Mountain Club members) to stay the night, and has a spring to fill your water bottles. Following the Gulfside Trail 0.5 miles from Mount Jefferson to Sphinx Col, hikers encounter the first “optional” summit of the trip: the 5,533-foot tall Mount Clay. Since Clay is really a sub-peak of Washington (and thus not one of the 48 official New Hampshire 4,000 footers), it’s not always necessary, but it is still worth the short loop detour for the views of the Northern Presidentials and the ground you’ve already covered. That said, many on the Traverse bypass Clay’s summit and the extra 0.3 of a mile and few hundred feet of elevation by continuing on the Gulfside Trail for 1.4 miles to the summit of Mount Washington. Once past Clay, the hike up Washington on the Gulfside often feels like the longest part of the Traverse. Although the summit looks just minutes away, appearances are deceiving and it’s still more than a mile away. The trail also remains unrelenting and rough. Thankfully, you’ll have great views of Burt’s Ravine, the Great Gulf, Mount Washington and the Cog Railroad to motivate your climb. And if at any point you stop to catch your breath, turn around to admire the distance you’ve already traveled, with Jefferson, Adams, and Madison laid out behind you. 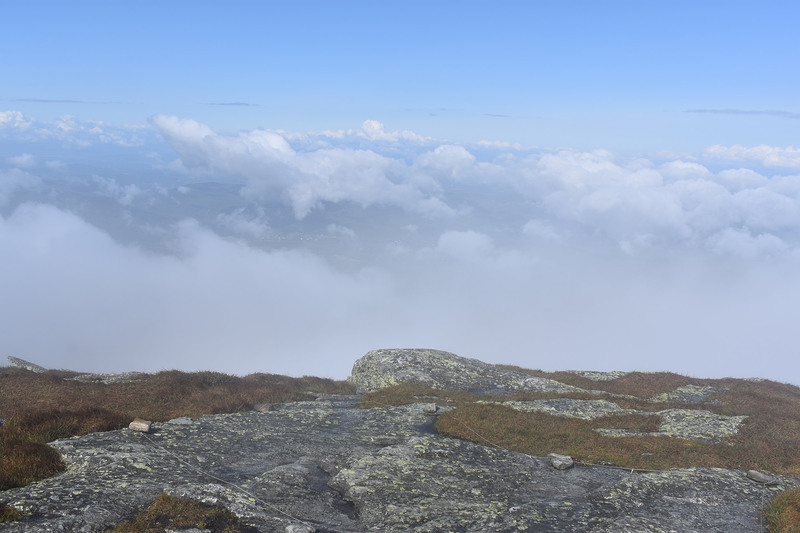 The summit view from New England’s highest peak (44.270584, -71.303551) certainly don’t disappoint. To the east, the Carters and Wildcats dominate the foreground, with, on a clear day, the Atlantic Ocean in the distance. Looking north, Madison, Adams, Jefferson, and Clay take up the skyline. West is the Bretton Woods ski area, followed by the peaks of the Pemigewasset Wilderness. Finally, to the south, the remainder of the Traverse is laid-out before you: Monroe, Eisenhower, Pierce, and Jackson. Of course, Washington—home to the “world’s worst weather”—doesn’t offer any summit views on some days. But even on rainy, cool, or cloudy days, you’ll also encounter more people on the summit than you will have on the entirety of this trip thanks to the mountain’s popularity, the auto road, and the Cog Railroad. Civilization isn’t all bad though if you brought your wallet, as the cafeteria in the Sherman Adams building on the summit offers the opportunity to eat and drink something different from regular hiking fair. On more than one occasion a Coke or piece of pizza has boosted morale, busted a bonk, and been key to a successful traverse. Additionally, it also offers a great place for hikers to refill water bottles and hydration packs. However, don’t let the warm food, places to sit, and great views, lure you into lingering too long on the summit. You still have 7.7 miles and several hours left. After Washington, the character of the Traverse changes, as you leave the rugged Gulfside Trail and continue for the duration of the trip (if ending at Mount Pierce) on the more gentle Crawford Path. 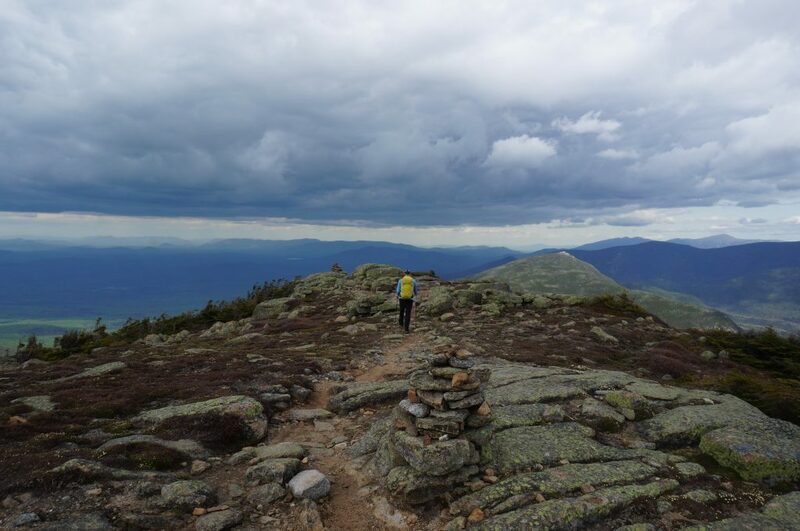 Almost 200 years old, the Crawford Path is the oldest hiking trail in the contiguous U.S., and at one time was used to guide tourists to the summit of Mount Washington on horseback. Also worth noting is that despite some small climbs, the majority of the trip is downhill from here. This is especially true of the 1.5-mile descent to AMC’s Lakes of the Clouds Hut (44.258831, -71.318817), the highest and largest hut in the White Mountains. Views of the Southern Presidentials dominate this portion of the hike. As you approach the hut, look for Lakes of the Clouds, a set of small ponds, on your left. Re-filling your water at the hut avoids the lines often found in Mount Washington’s summit, making it a faster and easier option. But again, don’t linger too long, unless they’re serving fresh-baked desserts or you’re planning to spend the night here as part of a multi-day traverse. From the hut, continue on the Crawford Path for 0.3 miles before connecting with the Mount Monroe Loop Trail. The Mount Monroe Loop trail climbs 350 feet to the open summit of Mount Monroe (44.255089, -71.321373), the fifth 4,000-footer of the trip. From here you get a striking view of Washington and Lakes of the Clouds behind you, and before you, the Crawford Path is visible as it snakes its way to your next objective Mount Eisenhower. Before departing, look east, down Monroe’s sheer cliffs and towards Oakes Gulf. Dropping off Monroe, connect again with Crawford Path and begin working your way across the 2.1 miles and the 500-foot climb up Eisenhower. Along this stretch you’ll encounter some of the most gentle terrain of the trip, and most likely not a moment too soon for your tired legs. It’s also here that you might begin to feel the effects of an even pleasant day spent above the tree line, as the sun and the wind can start to weather your resolve. After a steep, but quick, climb up Eisenhower’s flanks, you’ll encounter a giant cairn marking its summit (44.240688, -71.350342) and the sixth four-thousand footer of the trip. Take a moment to look back, take in the view, and appreciate the enormous distance the Traverse has covered so far. Then, if you have the energy, turn south and try to pick out the summits ahead: Mount Pierce (your next objective) and, if you continue further, Mount Jackson and Mount Webster. Leaving Eisenhower, rejoin the Crawford Path heading south towards Mount Pierce. Follow the Crawford Path for 1.3 miles to the split with the Webster Cliff Trail. Follow the Webster Cliff Trail 0.1 miles to the summit of Mount Pierce (44.227802, -71.364769), the seventh 4,000 footer of the Traverse. On the 1.4 miles between Eisenhower and Pierce you’ll begin to dip in and out of the trees, the first section of below treeline hiking since your ascent of Madison. While only picking up nominal elevation, the rolling nature of this part of the Crawford Path will have you legs feeling weary with the Traverse’s 8,700 feet of elevation gain. The summit of Mount Pierce also signals an exit from the high mountains, as it’s the day’s only peak that doesn’t offer views in every direction. 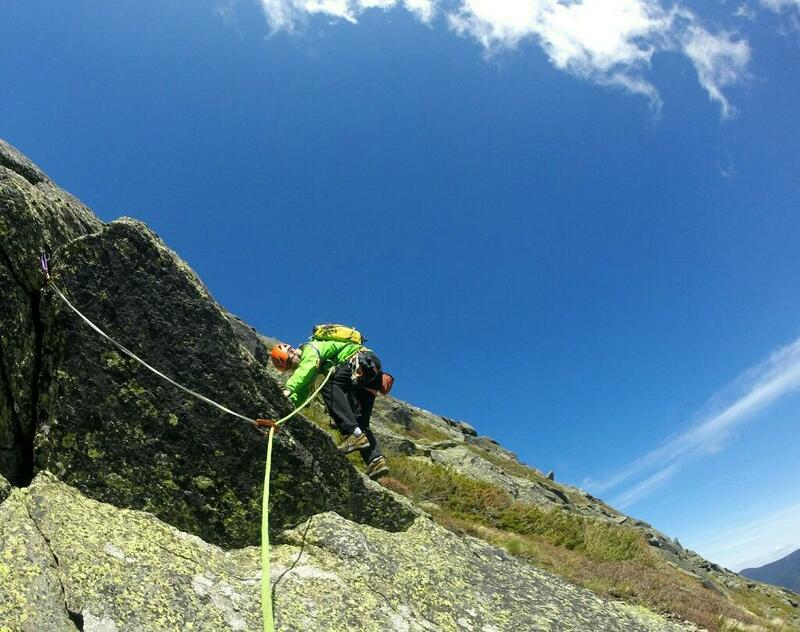 Traditionally, the Presidential Traverse “ends” at Pierce. If this is your final summit, follow the Webster Cliff Trail back to the Crawford Path. The beginning of the 3.2-mile descent to the Highland Center in Crawford Notch is surprisingly rugged and is characterized by rocks and roots. After a short time, the trail becomes significantly more moderate. As you get closer to Route 302, the sound of traffic is oddly comforting, letting you know that you’re almost there. If you’re not ready to be done, extend the Traverse by instead hiking south on the Webster Trail for 2.4 miles to Mount Jackson (44.2031, -71.3742), the eighth 4,000 footer of the trip. On the way, you will pass the Mitzpah Hut, giving you the opportunity to refill your bottles and bladder, buy dessert, or even stay for the night. Although Jackson’s summit delivers great views to the north, west, and south, the 2.4-mile trail is rough in parts and rarely a quick trip, especially with almost 20 miles under your belt already. Except for an open rocky section near the top, the 2.5-mile descent to Crawford Notch from the summit of Jackson on the Webster-Jackson trail is moderate and a little bit shorter than the descent from Pierce. Light is right on the Presidential Traverse. So if you have a good weather window and you’re trying to do the Traverse in a day, here are a few tips for trimming your kit. A super lightweight windshell like the Mountain Hardwear Ghost Lite is indispensable on a trip like the Presi that covers so much ground above treeline. If you picked the “right” day to do the Presidential Traverse, plan on getting a lot of sun, especially when hiking north to south. A sun hoody, hat with a brim, and sunglasses are great ways to protect your skin and eyes. 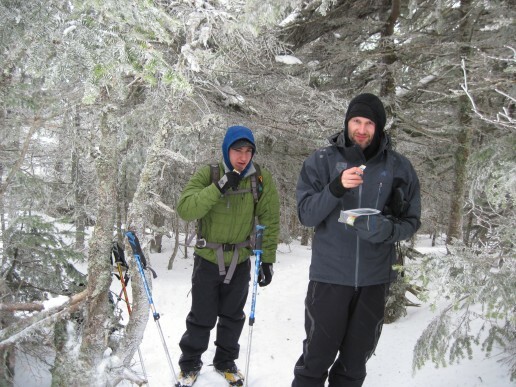 Even if the forecast is favorable, the Presidentials are notorious for bad weather. Be prepared for it with a lightweight puffy coat like the Black Diamond First Light and a rain shell such as the Arcteryx Beta SL. The weather changes fast in Presidential’s, make sure you’re ready for it with a winter hat and gloves. You’ll be crossing some of the most rugged terrain the White Mountain’s have to offer. Give your legs some support when they eventually get wobbly with a pair of collapsible trekking poles like the Black Diamond Alpine FLZ. Boots are great but trail runners like the Brooks Cascadia 12 are key for trying to quickly cover 20 plus miles. Hiking the Presidential Traverse is a big day in itself. Consider shuttling cars the night before to ease logistical challenges and ensure your vehicle a spot in the lot. If doing the full Presidential Traverse in a day seems like too much, there are three AMC Huts along the route (Madison, Lake of the Clouds, and Mitzpah). Using the AMC huts allows you to follow the lightweight ethic while getting to savor the traverse over multiple days. However, don’t expect to find much camping on route due to alpine zone restrictions. Because this hike is almost entirely above treeline, it’s not one to do in bad weather, so check the Mt. Washington Observatory Forecast before you go. If you get caught in bad weather, there are lots of trails to bail below treeline on, but they will create significant logistical problems and could make it difficult to get back to your car in a hurry. Many of the trailheads they end on are fairly isolated. Don’t count on weathering a storm in Mount Washington’s summit buildings. Getting an early start is a great tactic to avoid late afternoon thunderstorms. Even though the route is well marked, it’s a good idea to bring a map in addition to a route mileage table to monitor your progress. If you’re looking to refuel post hike, check out Catalano’s Pizza in Twin Mountain on the way back towards I-93. If your phone has reception, call in your order ahead of time to make sure dinner is waiting for you. If you feel like you deserve a drink after a long day on the trail, Fabyan’s Restaurant has a decent beer selection, along with traditional pub food. Have you done the entire traverse or even a piece of it recently? Post your experience and the trail conditions (with the date of your hike) in the comments for others! It might be tempting to spend your Lakes Region vacation floating on Squam Lake, sitting on Weirs Beach, or riding the Winnipesaukee Railroad, but no trip to New Hampshire is complete without bagging a summit. 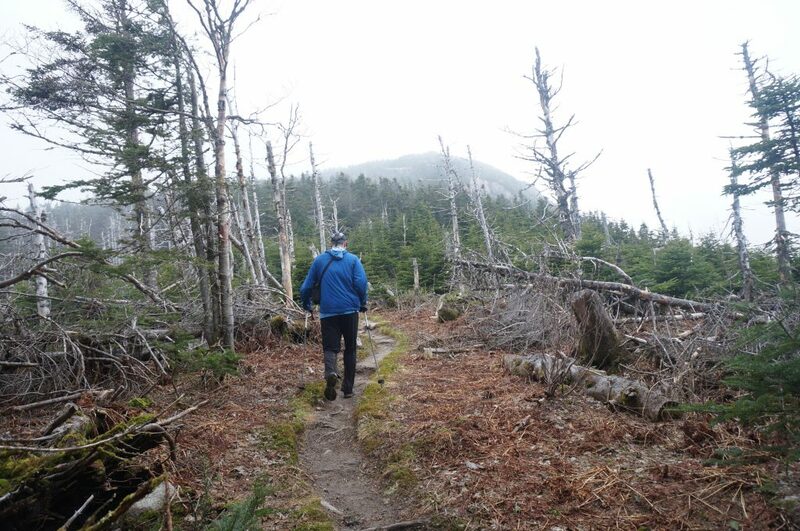 Whether it’s a quick scamper up West Rattlesnake Mountain or an all-day climb on Mount Chocorua, be sure to devote some time to exploring the area’s incredible local hiking. Looming above Squam Lake is one of the Lakes Region’s best moderate hikes: the Old Bridle Path to West Rattlesnake Mountain’s summit. Leaving from the parking lot off Route 113 in Holderness, it’s a two-mile round trip with less than 500 feet of elevation gain, all on a well-maintained, yellow-blazed trail that is family friendly and suitable for first-time hikers. The view south of Squam Lake from the summit’s rocky slabs will impress even the most seasoned White Mountain hikers. For the peak-baggers among us, follow the well-marked Ridge Trail east from the outcrops for over 100 yards to the true summit. If you have more energy, consider adding on some extra miles by hiking on toward East Rattlesnake Mountain or downhill toward Five Finger Point, a peninsula that juts into Squam Lake. The downside? West Rattlesnake is pretty popular, especially on weekends. To avoid the crowds, consider an early or late start, as the hike is easy enough to complete in an hour or so. Just don’t blame us if you’re late returning because you’ve been lingering on the summit to enjoy the views! Another family-friendly hike, Belknap Mountain is one of New England’s 50 most topographically-prominent peaks. Three different trails—the Red, Blue, and Green—start at the Belknap Carriage Road parking area and wind their way up over the course of a mile. All are well-marked and have about 700 feet of elevation gain. Once you get to the summit, make sure to climb the fire tower. It offers a fantastic 360-degree view of the region, with Lake Winnipesaukee being the most prominent feature. If you can pull yourself away from the views (and be careful once you do, because the stairs are steep), explore the old ranger’s cabin and still-working water pump, which are a short distance downhill on the Green Trail. When planning your Belknap Mountain hike, be mindful that the Carriage Road gate is only open from 9 a.m. to 6 p.m. It’s also worth noting that the Carriage Road’s final segment to the upper parking lot is a steep dirt road that may be difficult for cars with low clearance. But, don’t let either of these stop you from enjoying Belknap Mountain. Instead, you can do a slightly longer hike along the Gunstock Mountain Trail, starting from the lower parking area. The Morgan and Percival Loop hike is another must-do. Starting from the same parking lot as West Rattlesnake Mountain, this 4.9-mile loop offers something for everyone—fun terrain, a chance to push yourself outside of your comfort levels, and, most notably, fantastic views. While the hiking found here is mostly moderate, the trail does present caves to crawl through, ladders to climb, and open ledges to walk across on your way to the summit of 2,220-foot Mount Morgan and then to 2,212-foot Mount Percival. Of course, if crawling, scrambling, and climbing aren’t your thing, walk-arounds make this hike suitable for almost everyone. Leaving from the parking lot off Route 113, the Morgan and Percival Loop combines four separate trails: the Mount Morgan Trail, the Crawford Ridgepole Trail, the Mount Percival Trail, and the Morse Trail. Hikers will find them well marked and easy to follow, with signs at all main junctions. Because the trail descending Mount Percival is more gentle in nature, summiting Mount Morgan first is preferred. Be warned that this hike, like its neighbor, is incredibly popular. If you get to the trailhead late, you might find yourself parking on the street and not in the lot. On a positive note, there are plenty of views to go around! If you’re looking for something a little more difficult, consider the Welch-Dickey Loop. What attracts many is its big-mountain feel jam-packed into just a few miles. With jaw-dropping views, semi-exposed ledges, massive stone slabs, and above-treeline hiking, Welch-Dickey seems like a hike found in New Hampshire’s “big” mountains. However, with Welch Mountain standing at just 2,605 feet and Dickey Mountain peaking at 2,743 feet, even those of us with sea legs can summit both. Although it’s far from New Hampshire’s most challenging, be warned that it can feel longer and harder than its 4.5-mile length. As well, expect to climb over 1,600 feet and through terrain that can be challenging for non-hikers. Also, because of the hike’s slabby nature, it can be difficult when wet. Located off Route 93’s exit 28, the Welch-Dickey Loop sits at the Lakes Region’s northern corner. Navigation is relatively easy, as yellow blazes and cairns clearly mark the trail. Most prefer to go counter-clockwise and summit Welch Mountain first, before heading to Dickey Mountain’s summit. Expect to pay a $3 per-day fee to park at the trailhead, or splurge and buy a White Mountain National Forest season pass for $20. The pinnacle of Lakes Region hiking, Mount Chocorua is one of the Whites’ most recognizable mountains. While just 3,478 feet, its rocky, treeless summit leads many to believe it’s much greater in stature than it is. As such, Mount Chocorua is as challenging, if not more so, than many of New Hampshire’s 4,000-footers. When you consider the exposed ledges, steep slabs, and above-treeline weather, hikers should plan for a full day. The most popular and direct route up, Piper Trail starts off Route 16 in Albany, N.H., behind Davies General Store. At 4.5 miles (nine miles round trip) and gaining roughly 2,700 feet, the Piper Trail presents a challenge even for seasoned hikers. And, with very steep sections, open ledges, and cliffside scrambling, this trail is perfect for those who like a charge of adrenaline. For a different route up, continue approximately one mile past the Piper Trailhead on Route 16 to the White Ledge Campground and the Carter Ledge Trail. With nearly the same mileage and vertical gain, the Carter Ledge Trail gives you an option to beat the crowds. However, while this makes the route slightly harder to follow, you intermittently get fantastic views of the summit along Carter Ledge. If you’re heading to the Lakes Region, or are looking for a reason to go, check out some of these fantastic hikes for their impressive views and challenging terrain. And, of course, we want to hear about your experience. In the comments, tell us which Lakes Region hikes you love or just about the great day you had here! 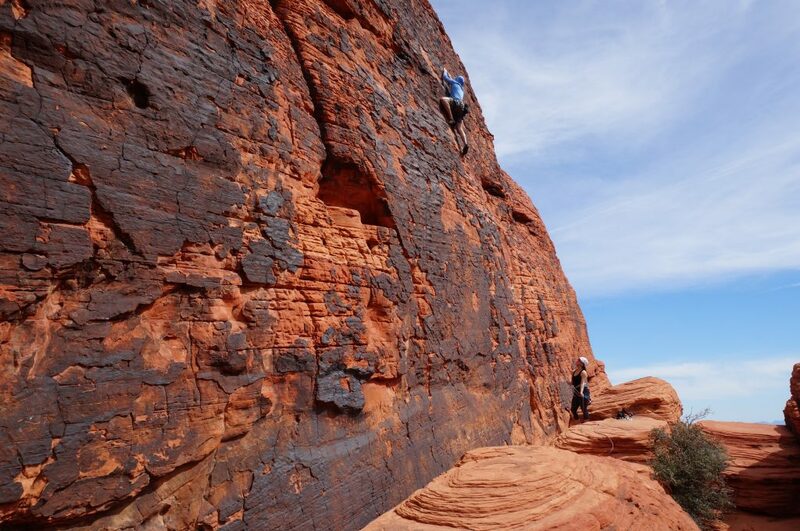 Sport climbing is one of rock climbing’s fastest-growing segments. If you’re an aspiring sport climber looking to spend a day (or week) clipping bolts, this checklist will get you outfitted. So, gear up, climb safely, and start sending—rope gun not included! 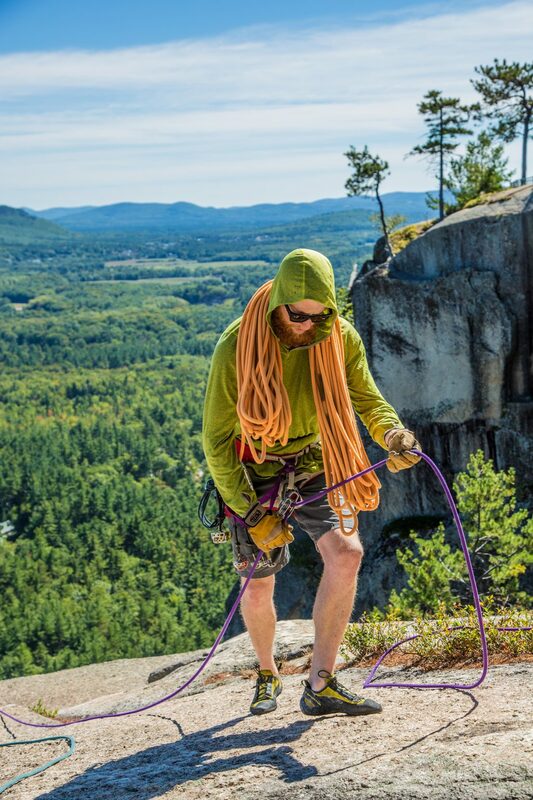 If you plan on visiting a variety of sport-climbing areas, a 70-meter rope is now the way to go. While a 60-meter length will be sufficient for many older routes, 70-meter ropes are rapidly becoming the standard. Thus, having a 70 will ensure that you don’t end up short when it comes time to send that super-long project. Most also aren’t all that more expensive than their 60-meter counterparts. In addition to getting longer, ropes are also becoming skinnier. For a nice blend of lightweight performance and durability, look at those between 9.6mm and 9.8mm thick. 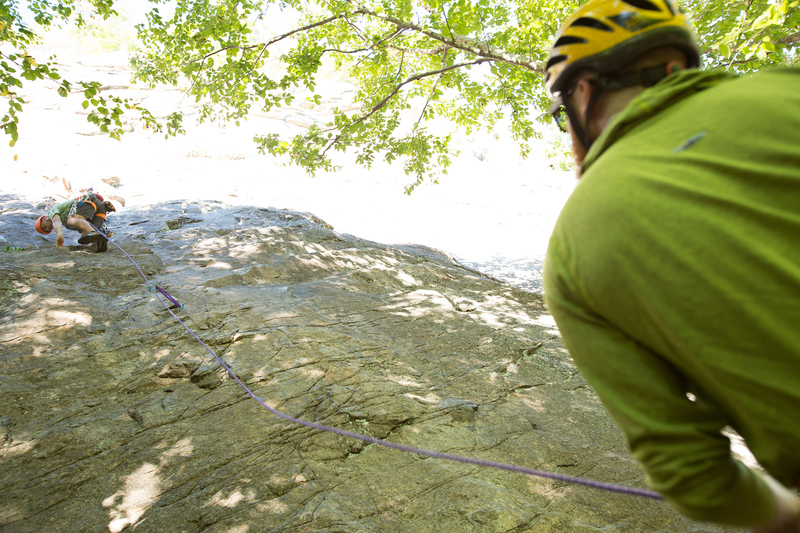 Ropes below 9.6 will likely wear too quickly for first-time outdoor climbers. On whichever length or diameter you decide, consider getting the dry-treated version. Although it will cost more initially, you’ll save money in the long run. In use, the treatment helps keep the rope dry, reduce abrasion, and prevent dirt, sand, and other particles from getting embedded into the fibers. For one final point: Before you climb, put a knot in the rope’s free end. That way, your belayer can’t lower you off if your rope ends up being shorter than required. To help keep your cord clean, a rope bag with a tarp is a worthwhile investment. Whether it’s clipping bolts out West at Red Rocks or nearer to home at Rumney, stacking the rope on a tarp prevents sand, dirt, and mud from getting inside its strands and causing abrasion, which, over time, weakens and discolors the material. The Black Diamond Super Chute has been a longtime favorite of ours. 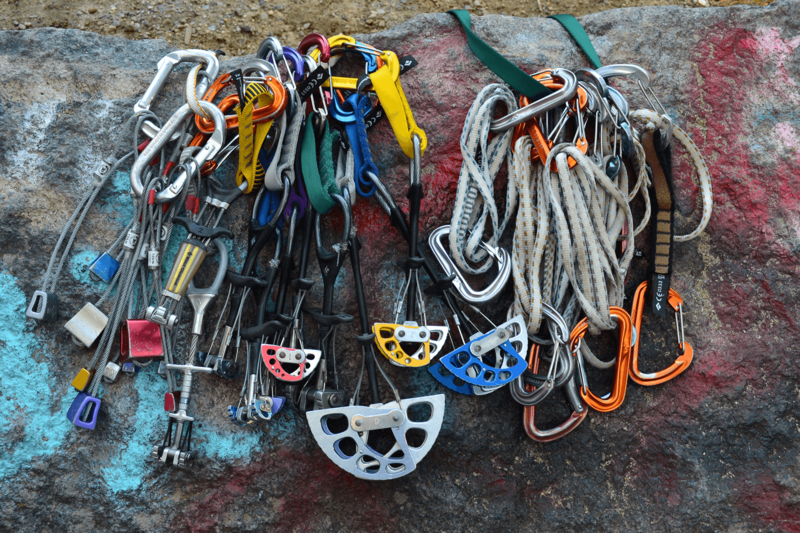 Climbers use quickdraws—two non-locking ‘biners joined by a “dogbone”—to connect the rope to the bolts. We bring 12 to 18 quickdraws for a day of sport climbing. Because most routes don’t require that many, it is a good practice to carry the same number of draws as your route has bolts, plus one or two more in case you drop one. Counting the number of bolts and checking the guide book are two good ways to figure out how many you should carry. Depending on your priorities, you can get quickdraws with thin Dyneema runners or fat nylon dogbones. Although thin runners help keep the weight down, quickdraws with thicker ones can be very handy for hauling yourself back up to that crux move. A stiffer dogbone also makes reaching for the clip a little easier. When we’re climbing with a group of folks who will be following the route on top-rope, we carry two “alpine draws”—a quickdraw made with a shoulder-length Dyneema sling instead of a dogbone—with locking ‘biners to clip to the anchor. It’s an easy, efficient, and safe way to anchor into the bolts at the top. It also prevents wear on the fixed gear. Even if you already own a belay device, an assisted-braking option like the Petzl Grigri 2 is awesome for sport climbing. They are especially useful if you’re belaying someone working a route, as they involve less effort to hold a person while he or she rests. Because sport climbers carry minimal gear and don’t spend as much time hanging in their harnesses compared to trad or aid climbers, specific models tend to have less padding than those intended for all-around use. While these are fantastic if you’re projecting the crag’s hardman route, most of us mortals will be okay with an all-around harness. Look for something that fits well, has enough gear loops, and is comfortable enough to hang in for a few minutes at a time. 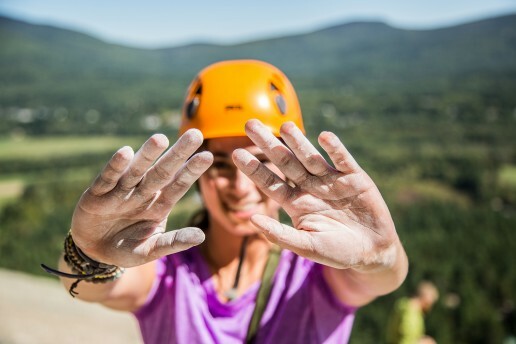 If you’re like us, just the mere mentioning of climbing, never mind racking up, causes your hands to sweat. So, clip a chalk bag to your harness, tie it around your waist with a cord, or get a belt to make sure sweaty, slick hands don’t keep you from sending. A cordellette, a prusik, a double-length sling, and a few extra locking ‘biners are great additions to any sport-climbing kit. Combined, they only weigh an extra pound or two and will be really useful if you find yourself rappelling, needing to escape the belay, or building a ground anchor. Many are also adding a personal anchor system to their kit to ease the the cleaning process. 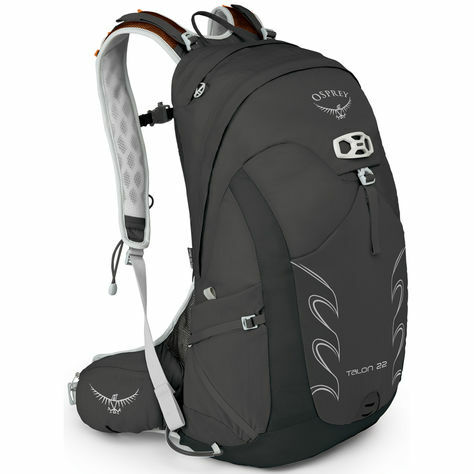 Bring one on your next trip to the crag, and enjoy the adjustability and safety provided. Visit most popular sport crags, and you’ll likely see more people without helmets than with them. But, just because wearing a helmet here isn’t the norm, that doesn’t mean it’s a bad idea. After all, objective hazards like rockfall or dropped gear still occur. A helmet also protects your head in the event you end up inverted when taking a whipper. Even better, helmets seem to get lighter and more breathable every season, making them so comfortable it’s easy to forget you’re even wearing one. The Black Diamond Vector offers a good blend of performance and protection at a reasonable price, and has been on our heads for the last few years. Today’s climbers are blessed with an incredibly large and diverse selection of climbing shoes. But, what works well for one person might not for another. It’s been our experience that, more often than not, it’s a climber’s ability to use their feet rather than a particular shoe that lets them make it to the anchors. If you’re looking to narrow down your choices, however, a Velcro shoe or slipper is easy to get in and out of at the crag. You can slip them off for belaying or giving your feet a break when you’re not climbing, and pull them on quickly when it’s your turn to go again. There’s nothing worse than getting to the climbing area, and then wandering around aimlessly looking for a route. So, before you head out, make sure to get the guide book for your destination. It will give you a general lay of the land, get you to routes of interest, and maybe even offer some specific beta. It also makes a great place to record any routes you’ve sent! A bag between 35 and 42 liters is perfect for carrying your gear, food, water, and a camera from the car to the cliff. While any pack in this range should suffice, a handful are designed for cragging. These offer easy access to supplies, and often include items like integrated gear loops, tarps, and pockets for holding specialized equipment like chalk and shoes. Even on warm days, a puffy coat can be a valuable addition, as it’s a great way to keep comfortable between burns and belaying. Sticky-soled approach shoes like the 5.10 Guide Tennie can be a nice addition if you climb at popular locations that involve scrambling from crag to crag. Accidents can and do happen, so it’s always a good idea to have a first aid kit. Add a couple of climbing-specific items, like nail clippers, climbing tape, and hand warmers, especially for the spring and fall. A headlamp is light, packable, and always a good idea to have in your bag. If any or all of this feels too involved, a lesson with the EMS Climbing School is a great way to get your systems in place before heading out on your own. This list contains pretty much everything you need for heading out to clip some bolts. But, you can add equipment to make the day more enjoyable or safer. Belay glasses to ease neck strain? An insulated water bottle for keeping cool when the pressure to send rises? Sending biscuits (Oreos) for positivity? In the comments, let us know the one thing you can’t live without at the crag! Looking back on some of our early hikes together in New Hampshire’s White Mountains, the first thing that sticks out is how much time we spent agonizing over the “right” gear to bring. Always packing at the last minute, we both had many late nights where we considered what to bring and what to leave behind. Indeed, questions like what layers we would need and how much emergency gear is too much kept us up way past our earlier bedtime and often resulted in packs that were bigger and heavier than they should have been. These days, with many 4,000-footers under our belts, our process is much more dialed. Our packs, as a result, are a lot lighter and smaller. So, what’s our ideal kit for summer hiking in the White Mountains? A long-sleeve, hooded sun shirt, like the Black Diamond Alpenglow Sun Hoody, is the staple of our kit. It’s no warmer than wearing a short-sleeve T-shirt, with the added benefit of keeping the sun off your arms and head. The long sleeves and hood also serve a second purpose during bug season. Then, for layering over the sun shirt, we pack three additional layers: a windshirt, a lightweight rain shell, and a puffy. The most versatile layer, the windshirt easily handles the Whites’ ever-changing weather. From lightweight, ultra-packable nylon versions like the Mountain Hardwear Ghost Lite to more substantial woven jackets, such as the Outdoor Research Ferossi (also available in women’s sizes), these jackets take up minimal space and are perfect for hiking above treeline or if the temperature drops. As staying dry is one of hiking’s central tenets, a good waterproof hard shell is vital. However, much like windshirts, shells vary in weight and durability. While an ultra-lightweight option like the Outdoor Research Helium Hybrid might be perfect for when you’re wearing a small pack or the chance of rain is slight, a more robust option made with heavier-duty nylon and high-end waterproofing like the Marmot Minimalist Jacket (also available in women’s sizes) makes more sense if the forecast looks wet. A lightweight puffy, like the Arc’Terxy Atom SL Hoodie (available in women’s sizes), is the final upper body layer. Whether you’re waiting while your hiking partner gears-up in the parking lot, taking in the White Mountains’ fantastic views, or facing a real emergency, a good puffy can be the difference between feeling cozy and being miserable. When it comes to pants, we keep it pretty simple. A stretchy soft shell is our general go-to, but the exact weight depends on the forecast temperature. 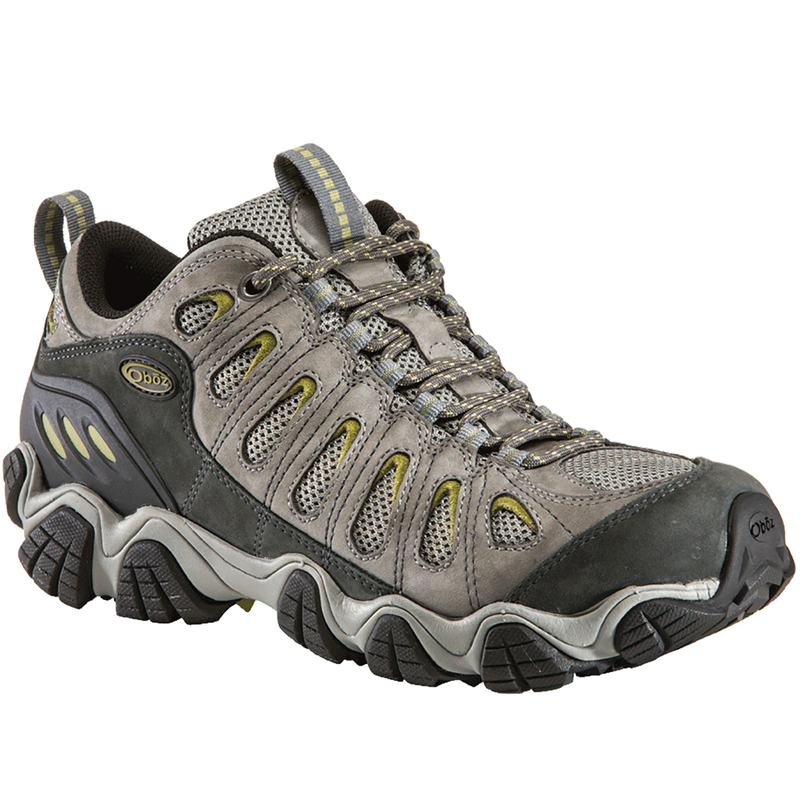 If only one pair is in the budget, check out the Marmot Scree—the perfect blend of comfort and durability. Plus, you can add a base layer underneath to adjust their warmth. With June being a fierce bug month, however, the one thing you won’t find us wearing is shorts. If the weather looks wet, bring along a pair of rain pants, as well. Although the amount of time carrying rain pants far exceeds the time spent actually wearing them, we are always thankful to have them during a heavy rainstorm. Pick something like the EMS Thunderhead for the right amount of lightweight breathability, at a price that won’t break the bank. Picking the right footwear is one of the most complicated decisions for spring and early-summer hiking. On some trips, where encountering snow, deep mud, and wet trails is a real possibility, waterproof hiking boots are mandatory. As the snow melts, water crossings get less spicy, and the trails begin to dry, we transition to waterproof trail runners for their lighter weight and ability to provide some protection in muddy, wet conditions. And, as the trails dry further, you’ll find us wearing regular trail runners for the chance to let our feet breathe. 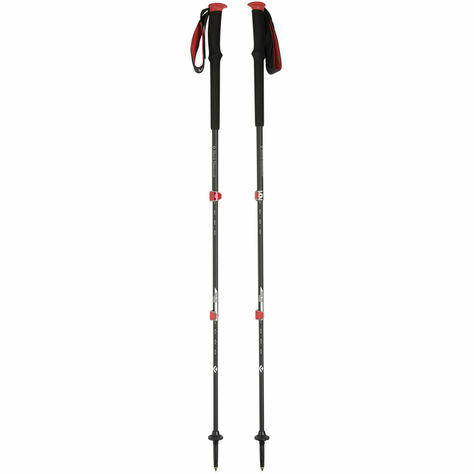 We also carry trekking poles to reduce the strain on our knees and improve balance. Warm-weather hikers will appreciate a pole with either cork or foam handles, like the Black Diamond Trail Pro, as they help absorb moisture from sweaty hands. With many of the White Mountains rising above treeline, the weather on your favorite summit can be starkly different from what you found in the parking lot. To prepare, we carry a winter hat, as having one can make the difference between enjoying a summit vista or scrambling back down to the trees. For the same reasons, we also pack a pair of EMS Power Stretch Gloves. In the early spring, we often supplement them with a warmer set of gloves or mittens. Finally, for sun and bug protection, the venerable trucker cap is a staple of almost every trip. With their mesh backs, truckers vent well, making them ideal for high-exertion activities. When you pack for a day in the mountains, it’s fun to think about summits and good times. But, you should also take a minute to plan for the worst-case scenario. While packing the layers mentioned above checks off some of your essentials, and our guide helps you out with food and hydration, you still need a few more items. A headlamp, like the powerful and rechargeable Black Diamond ReVolt, is important, just in case the hike is longer than expected. A lightweight bivy can be a lifesaver if someone gets injured and you need to wait for help. As well, a minimalist first aid kit, supplemented with other first aid supplies, helps address trail injuries. Additionally, fire starters, a water purification device like a Sawyer Mini-Filter or purification tablets, and a map and compass (or another navigational device) are all worth the extra weight. Although this may seem like a lot of gear, it all fits neatly into a 20- to 30-liter pack. The Black Diamond Speed Series—especially the Speed 22—delivers the space you need in a lightweight, no-frills package. While it may be tempting to bring a larger bag, remember that you’ll end up filling that extra space, resulting in a heavier load, slower times, and maybe a missed summit. 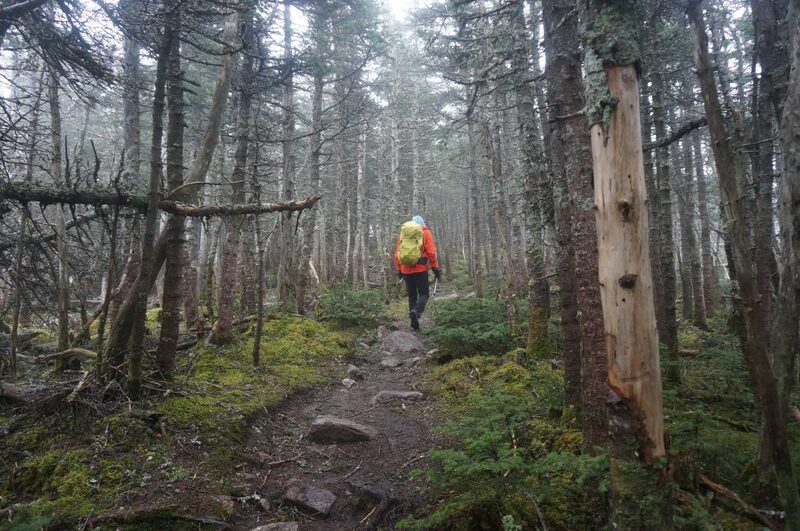 Although not every item listed above is essential to hiking a New Hampshire 4,000-footer, having the right combination of layers, equipment, and emergency gear can make your experience safer and more enjoyable—not to mention more efficient. But, the best advice is to get outside and discover what works for you. If you have a key piece of hiking gear, tell us about it in the comments! With almost 50 4,000-footers to choose from, picking out just a few with the best views can be as challenging as hiking them. No matter where you hike in the White Mountains, you’re in for a visual treat, but these six take the cake for the most impressive summit views. That is, if you can get up to them. If you are looking for a big view, with a minimal investment in “sweat” equity, try Mount Pierce. It delivers the best view-to-effort ratio among New Hampshire’s 4,000-footers. Beginning from Route 302 in Crawford Notch, a little over three miles of hiking on the gentle (for the Whites) Crawford Path brings you to Mount Pierce’s stunning summit. With its almost 360-degree views, a lot can catch your eye. But, first, you’ll have to avert your gaze from the jaw-dropping perspective of Mount Washington’s southern aspect, the Ammonoosuc Ravine and the Cog Railway. From Pierce’s summit, you can head back to Crawford Notch. Or, if you’re feeling fit, follow the Crawford Path for an additional 1.2 miles to Mount Eisenhower, another New Hampshire 4,000-footer with fantastic views. From Eisenhower, you can backtrack on Crawford Path or take the Edmands Path to Mount Clinton Road, and then road-walk back to Crawford Notch. Another moderate 4,000-footer with great views is Cannon Mountain. Located directly off Route 93, this 4.4-mile round-trip hike up the Hi-Cannon Trail gains approximately 2,000 feet on the way to one of the Whites’ best views. 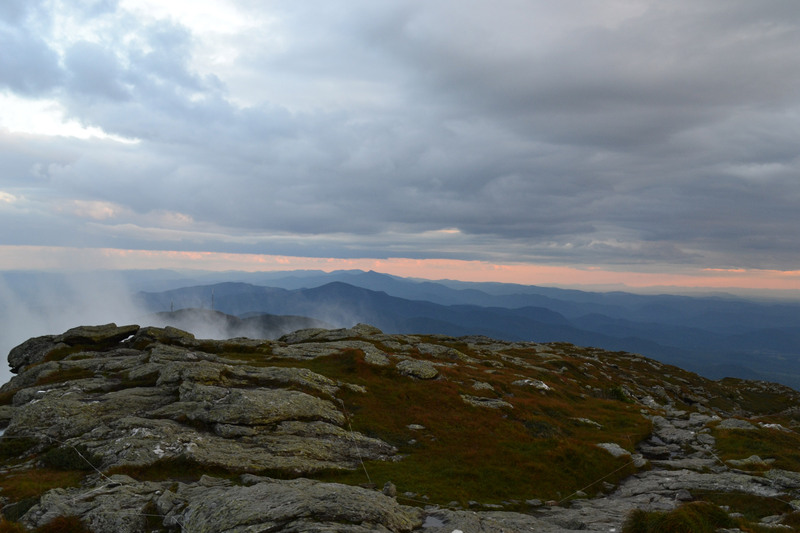 Once you get to the top, climb the summit tower, and look east for a breathtaking vantage of the iconic Franconia Ridge. On a clear day, you can look past the ridge to see the Presidentials, including Mount Washington. To the south, you can see the Kinsmans and, to the west, the Connecticut River and Vermont’s Green Mountains. On days when the tram is running, Cannon’s summit gets busy, however. Luckily, the Hi-Cannon Trail has a few great places to sit back and admire the view without the crowds along the way. Plus, you can poke around the summit’s Franconia Ridge side for slides offering solitude and stunning vistas. Most climb Garfield via the Garfield Trail, which starts at the Garfield Trail parking area off Gale River Loop Road. From the lot, it is five moderate miles to the foundation of an old fire tower on Garfield’s bald summit. From there, you can look out at the entire Pemi-Loop. Here, the distinct peaks of Franconia Ridge extend on your right and Twins and Bonds to your left. In the middle lies Owl’s Head and the eastern half of the Pemigewasset Wilderness. On clear days, don’t forget to look further east towards the Presidentials to find Mount Washington looming on the horizon. If day-hiking 10 miles feels like too much effort, or if you like to linger, the Garfield Ridge campsite is only 0.2 miles from the summit. Stopping here makes this trip a little more accessible for those looking to step up the effort level or just wanting to take it slow. Another 10-mile out-and-back trip brings you to what many consider to the Whites’ best view, Mount Carrigain. Leaving from the parking lot on Sawyer Pond Road, off Route 302, hikers can follow the Signal Ridge Trail as it slowly gains altitude towards the 4,700-foot summit. As you approach, you’ll gain a ridge that meanders in and out of the trees. In between, a few spots give you a sneak peek of what’s to come. Forge past these appetizers to the main course, the observation tower on Carrigain’s summit. From the tower, you’ll get an unimpeded view of many of the Whites’ most notable areas. To the northeast, you will see Mount Washington and the mighty Presidential Range with Crawford Notch laid out before it. To the west is a breathtaking view of the Pemigewasset Wilderness. Look back toward Signal Ridge to get a great look at the terrain you covered to earn this dramatic view. Then, after taking in some of the Whites’ hottest vistas, cool off in the numerous pools and eddies found along the river that hugs the Signal Ridge Trail for the first mile. If you’re looking to truly “earn” your views, Bondcliff and Madison are strenuous yet rewarding options. Of all the 4,000-footers, Bondcliff might be the best at making you truly feel like you’re in the mountains. With views in every direction and a sheer cliff on one side, it exemplifies the ideal summit. Although none of the hiking up is particularly difficult, there is a lot of it. From the Lincoln Woods Visitor Information Center, follow the Wilderness Trail to the Bondcliff Trail roughly nine miles to the summit. Standing on the cliff’s side can give you the feeling that you’re on the edge of the world—that is, until you look out. Look to the west to clearly see the eternity of Franconia Ridge. Then, turn your gaze to the right, where the Pemigewasset Wilderness unfolds with the prominent peaks of Mount Bond and West Bond in the foreground and Mount Garfield looming in the background. Turn away from the cliff, and the Pemigewasset Wilderness’ entire western half dominates the landscape. For those willing to expend the effort, Mount Madison, located at the end of the Presidential Range, delivers big views after a heavy dose of hiking. While numerous trails lead to the summit, the most common, and perhaps “easiest” way, is to leave from the Appalachia Trailhead parking lot on Route 2. Then, follow the Valley Way Trail to the Madison Hut, before connecting with the Gulfside Trail for just under a half-mile above-treeline push to the top. Despite being under eight miles round trip, this route is rocky, rugged, and gains roughly 3,500 feet in elevation. The summit delivers a dramatic view of the northern Presidentials and the three tallest 4,000-footers: Mount Jefferson, Mount Adams, and Mount Washington. From here, what’s always striking is the expansiveness and remoteness of the Great Gulf Wilderness—a glacial cirque walled off by the Presidentials’ prominent peaks. If Mount Adams looks enticingly close, that’s because it is. At a little under a mile and a half away, tagging a second summit is very doable for fit and motivated hikers. For even more of a challenge, the Star Lake Trail, which leaves from Madison Hut, has much better views than Air Line, the normal thruway, and is among our favorite trails in the Whites. 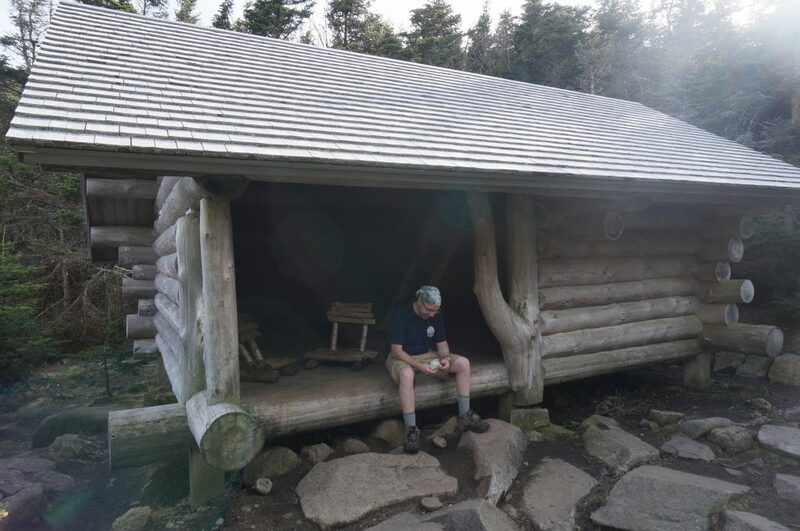 Farther down, the AMC’s Madison Hut can turn this long day hike into an enjoyable overnight, or provide the perfect place to stage a summit attempt on Mount Adams. Limiting ourselves to the six “best” summit views forced us to leave several great 4,000-footers off our list. Fantastic cases can be made for others, including Moosilauke, Washington, and Franconia Ridge’s Lincoln and Lafayette. So, whether you agree with us or not, make your case for the Whites’ best views in the comments below. 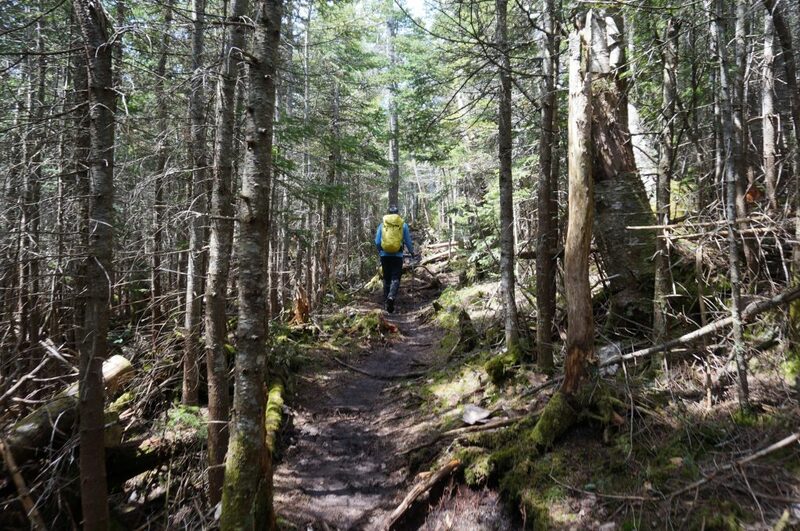 One of the Northeast’s great backpacking adventures proves that good things don’t come easy. 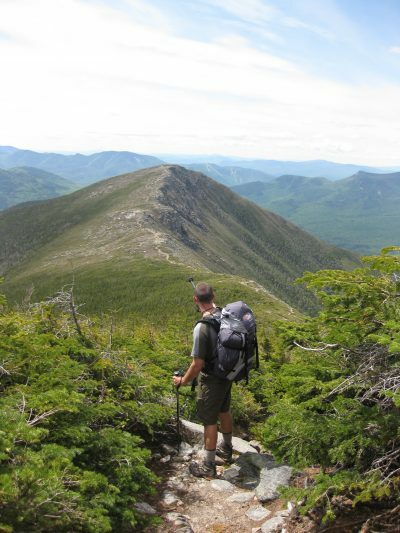 The Pemi Loop represents the ultimate goal for many New Hampshire peak baggers. It traverses the ridgelines of three different ranges—Franconia, Twin, and Bond—in one epic loop around the western half of the 45,000-acre Pemigewasset Wilderness. With its eight summits and the potential to tick four more via minor detours, the possibility of summiting a quarter of the 48 4,000-footers, all while spending a significant chunk of time in New Hampshire’s largest wilderness area, is a thrilling prospect. More significantly, with huge views, amazing above-treeline stretches, and the reputation for being one of the country’s hardest hikes, the Pemi Loop is a feather in the hiker’s cap and one of New Hampshire’s best, hands down. If you’re coming from Interstate 93, getting to the Lincoln Woods Trailhead is easy. Take exit 32 and follow Route 112, better known as the Kancamagus Highway. After driving through the town of Lincoln and past Loon Mountain, look for the trailhead on your left. If you’re coming from the North Conway side of the Whites, follow Route 16 to Route 112 (Kancamagus Highway) up and over Kancamagus Pass and past “the hairpin turn” at the Hancock Overlook Parking Area, and the trail will be on your right side. Leave the parking lot on the Lincoln Woods Trail, and cross the East Branch of the Pemigewasset River on a suspension bridge. At the end of the bridge, the trail turns right, following an abandoned railroad bed for 1.4 miles to the Osseo Trail (44.082691, -71.581635). At the junction, turn left on the Osseo Trail, and follow the yellow rectangular blazes toward Mount Flume, the route’s first 4,000-footer. At 4.1 miles long, the Osseo Trail gains elevation moderately for the first few miles before steepening, leading to a series of ladders, and eventually putting you on the Franconia Ridge Trail for a final, short burst to the summit (44.108826, -71.628052). In total, you’ll ascend 3,100 feet on this climb, a significant chunk of the Pemi’s 10,000 feet of overall elevation gain. Before dropping back below treeline on the Franconia Ridge Trail, take a moment on Mt. Flume’s rocky summit to enjoy the view. The Kinsmans, Lincoln, and Interstate 93 are to the south and west. Owl’s Head, the Pemi Wilderness, and the Bonds are to the east. Then, the next step on your itinerary—Franconia Ridge—is to the north. Try not to feel overwhelmed, and just follow the yellow blazes as you start making your way along the 1.5 miles to Mount Liberty’s summit. The descent off Mt. Flume and across to Mt. Liberty is pretty relaxed. As you near the latter’s summit, you’ll encounter a few moves that require some minor scrambling. While they might briefly slow you down, they also mean you’re getting close to the second 4,000-footer of the day. Mt. Liberty’s stunning open summit (44.115730, -71.642097) is among the Whites’ best. However, while it’s tempting to linger here to take in the views of Loon Mountain, Cannon, and the Bonds, you still have a long way to go. Next up on the Franconia Ridge Trail are the 1.8 miles to Little Haystack Mountain. To get there, the route drops back below treeline and joins up with the Appalachian Trail at the juncture of the Franconia Ridge and Liberty Springs Trails. Follow the AT’s white dashes as it traverses, culminating in a short, steep climb to the open summit. On a typical weekend day, the crowds can be intense on top of Little Haystack Mountain (44.140476, -71.645905). So, instead, consider stopping on a rocky outcropping a little south of the actual summit before the juncture of the Franconia Ridge and Falling Waters Trails to take in the view, get a snack, and avoid the masses. 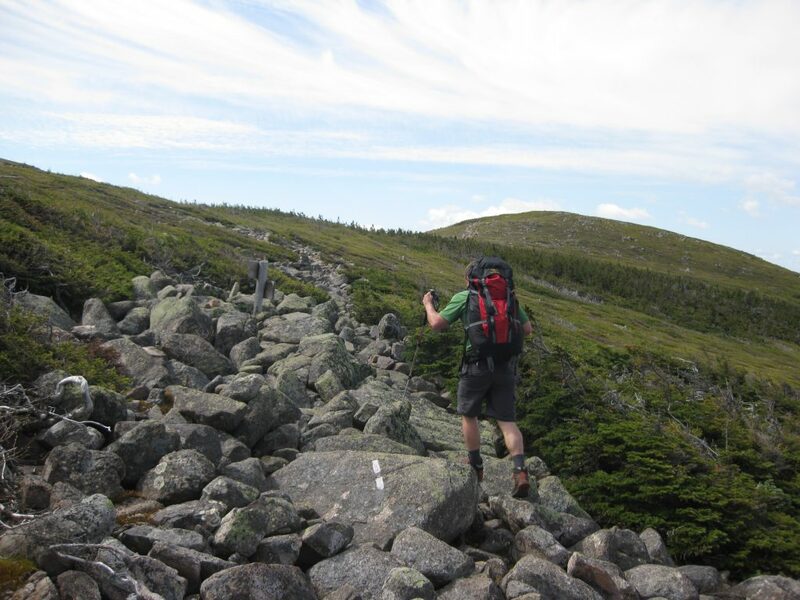 The Franconia Ridge Trail’s 1.7-mile stretch from Little Haystack’s summit to Mt. Lafayette’s is among the White Mountains’ most iconic. It is entirely above treeline, with views in every direction. In two pushes, you’ll cross Mt. Lincoln (44.148682, -71.644707) and Mt. Lafayette (44.160717, -71.644470), the third and fourth 4,000-footers of the day. Much like Little Haystack’s, Mount Lafayette’s summit is often crowded on a nice weekend day, with hikers doing the Franconia Ridge loop. Since you’ll be heading in a different direction from most after Lafayette, however, follow the Garfield Ridge Trail for a few minutes to find equally great views, without all the crowds. On a clear day, the view to the west, with Garfield in the foreground, followed by the Twins and the Bonds, and then the Presidentials in the distance, is fantastic. 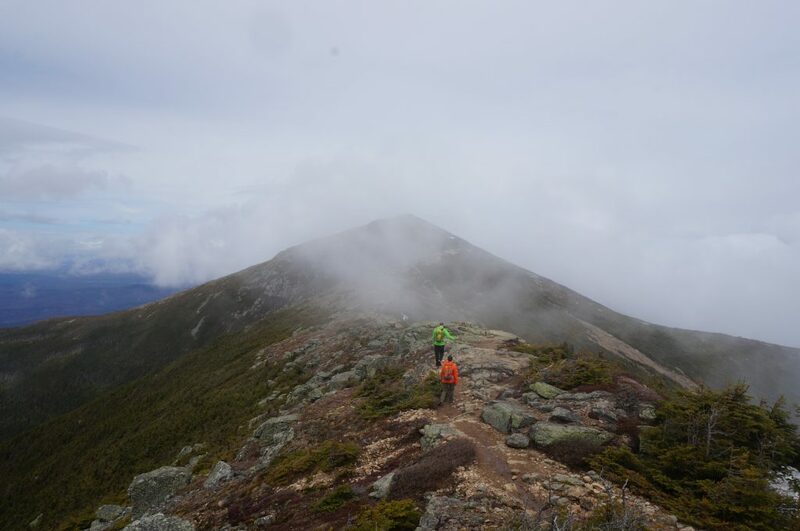 Although the beginning of the Garfield Ridge Trail closely resembles the Franconia Ridge Trail’s best stretches, this 3.7-mile section is the crux of the Pemi Loop’s first half. Dropping sharply before steeply climbing back up towards Mt. Garfield’s summit, the trail is rough, and the elevation change is dramatic. Moreover, at this point, the miles are starting to add up—more than 13 so far—and you might be running low on water. Garfield Pond (44.187107, -71.619034), on your left just before the trail starts heading up again on the final climb to Garfield’s summit, is the first on-route location since leaving Lincoln Woods to refill bottles. Once you’ve made it to Mount Garfield (44.187298, -71.610764), pause on the open, rocky summit to savor your fifth 4,000-footer of the day in the company of great views in every direction. Look right to admire your traverse across the entire Franconia Ridge. Then, look left to see how much farther you’ve left to go, with the Twins and Bonds before you. Turn around to admire the Pemi’s far edges and, on a clear day, to see all the way to Stowe, Vermont. From Garfield’s summit, continue following the Garfield Ridge Trail downhill for a short distance to the spur trail for the Garfield Shelter—a three-sided wooden lean-to—and tent site (44.190086, -71.607002) at mile 14.3. For backpackers planning on doing the Pemi Loop over three days, this is the logical place to spend the first night ($10 per person a night). The area is managed by the Appalachian Mountain Club, and space is available on a first-come, first-serve basis. However, it tends to fill up on prime hiking weekends. Even if you’re not staying at the Garfield Shelter, consider filling your water bottles at the spring located at the spur trail’s junction. It is one of the easiest and best water sources on the whole Pemi Loop. If you’re planning on completing the loop in just two days, we recommend pushing on toward Galehead Hut (44.187927, -71.568810), which is just under three more rugged miles from Garfield’s summit. Also managed by the AMC, this hut is a great option if you’re looking to go light. Although the hut is a more expensive overnight option, during prime hiking season, it comes with a multi-course dinner the night you arrive and a hearty breakfast the next morning. The food is top-notch. ($113 per night; make reservations in advance). It also has the only real bathroom you’ll see on the trip. If camping is your preference, the route to Galehead Hut also has a handful of places that meet the White Mountains’ rules and restrictions to pitch a tent (no camping within a quarter mile of any trailhead, hut, or shelter). Don’t camp directly on the trail! Regardless of where you end up staying, Galehead Hut is the trip’s halfway point and near Galehead’s summit. To get there from the hut, follow the Galehead Spur Trail 0.4 miles. The round trip is quite moderate, especially compared to what you’ve been doing. 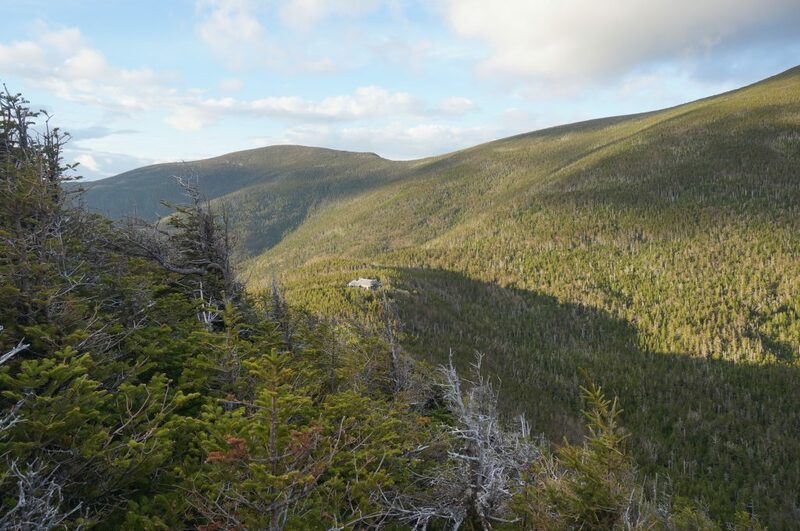 While the summit (44.185150, -71.573586) is surrounded by trees and has no views, near the top, a great overlook offers a spectacular view of the Pemi Wilderness, the Bonds, and Galehead Hut at South Twin’s western base. From Galehead Hut, follow the Twinway 0.8 miles to South Twin’s summit (44.187832, -71.554558), the loop’s seventh 4,000-footer. Don’t be lulled by the short mileage, however. This is the loop’s hardest ascent, and is slow-going, thanks to the elevation gain (1,200 feet) and the trail’s roughness. After a day of being above treeline, you’re about to hit some wooded summits. So, take a moment to enjoy the view from South Twin before pushing on. 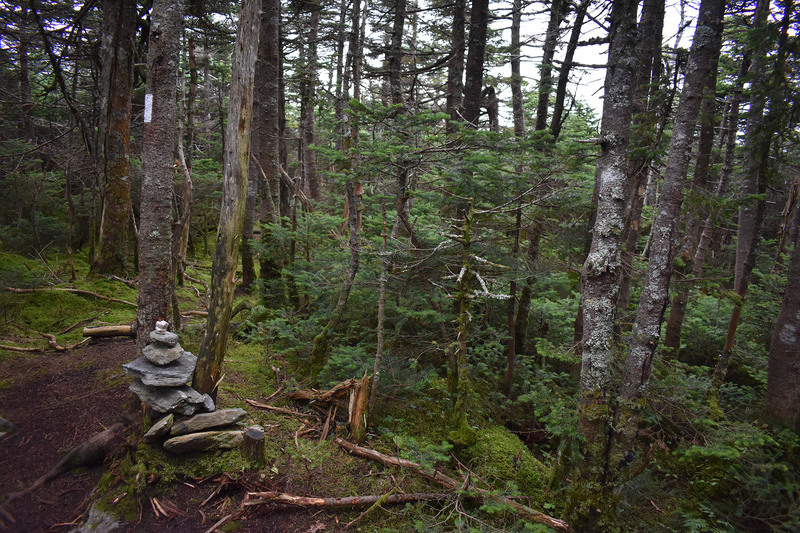 If you’re doing the “full” Pemi, leave your pack just off South Twin’s summit, and take the North Twin Spur Trail, a 2.6-mile round-trip hike with 750 feet of elevation gain to the summit of North Twin (44.202591, -71.557816), your eighth 4,000-footer. The traverse to North Twin is fairly moderate, with a couple of rocky steps on the final climb. Once you get there, take a picture at the summit cairn, appreciate the lack of view, and backtrack to South Twin. Once back on South Twin, follow the Twinway roughly two miles to the trail junction near Mount Guyot (44.168594, -71.535614). Still feeling ambitious? If so, drop your pack, and continue along the Twinway for 1.3 relatively easy miles (2.6 round trip) to Zealand Mountain’s summit and “bag” the journey’s ninth 4,000-footer. Just don’t go to Zealand expecting a sight, as it’s in contention for some of the Whites’ most uneventful summit views. If Zealand isn’t in the cards for you, take the Bondcliff Trail at the Guyot junction. From the junction, the trail is briefly above treeline, with fantastic views east into the Pemi, before dropping you at the spur trail for the Guyot Campsite (44.161049, -71.537468). Guyot Campsite has a shelter, six four-person tent platforms, and a composting toilet. At 0.2 miles from the trailhead, Guyot is the logical second night for backpackers hiking the Pemi Loop as a three-day trip ($10 per person a night, first-come, first-served). Its spring, which is a little ways down the spur trail, is also a reliable place to find water. From the Guyot Campsite junction, continue on the Bondcliff Trail a short way to the West Bond Spur Trail (44.158905, -71.537270). 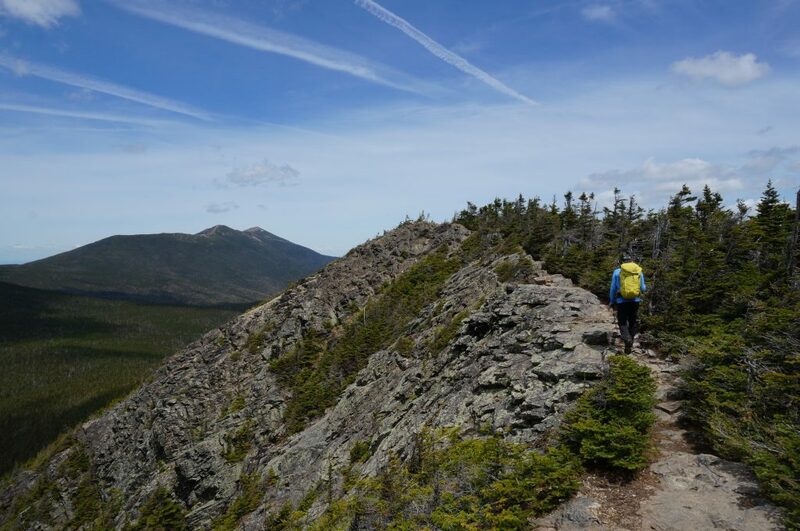 This is the “must-do” of the optional summits, and perhaps the hike’s best, because you really feel like you’re in the middle of the 45,000-acre Pemi Wilderness. So, drop your pack and make this one-mile round-trip side hike. Ascending a mere 350 feet, West Bond (44.154804, -71.543610) gets you the tenth 4,000-footer of the Pemi Loop. From the summit, you can’t see a road or any signs of civilization, no matter which direction you look. Back on the Bondcliff Trail, follow it uphill, mainly through the trees, for 0.5 miles before poking above treeline on Mount Bond’s summit (44.152889, -71.531250), the trip’s eleventh 4,000-footer. From Bond’s summit, you get a great view of what lies ahead, as the Bondcliff Trail winds towards the sheer walls of Bondcliff. Before leaving Mount Bond’s summit, get a hat, gloves, and windshirt ready. While the 1.2 miles between Mount Bond and Bondcliff are quite scenic (and among the Whites’ most beautiful), they are also either at or above treeline, leaving you exposed to wind and weather. Feeling warm and comfortable will allow you to enjoy the excellent views from the Bondcliff Trail as you approach the loop’s final summit, Bondcliff. No matter if you’re starting to get anxious for the hike to be over, or you don’t want the fun to stop, the numerous false summits on the way to the top can play mind games with even the most resilient of hikers. On Bondcliff (44.140419, -71.541260), savor the loop’s last summit—number 12—and one of the 48 4,000-footers’ most unique. Aptly named, Bondcliff features sheer cliffs, which make for incredible photos. From the summit, look back, and think about how far you have come, as the entirety of your trip is visible, from Flume to Bond. You would think that, with the last summit out of the way, the rest would be easy, but sadly, it isn’t so. From Bondcliff, you’ve got a lengthy 6.2-mile trek along the Bondcliff Trail back to the Lincoln Woods Trail. There is usually water to be found in the streams along your descent, and if you find yourself running low, it might be a good time to fill up. While the rest is either downhill or on flat ground, it takes a deceptively long time. The end of the Bondcliff Trail brings you to the Lincoln Woods Trail, the same route on which you started. From here, it’s 2.9 miles along an abandoned railroad. While your legs will enjoy the flat ground, the old ties can interrupt your stride enough to make this last bit harder than it need be. After 2.9 miles on the Lincoln Woods Trail, look for the suspension bridge where this crazy journey began. A Sawyer Mini Filter is a small investment for having easy access to potable drinking water. If you’re looking to go lightweight and keep your pack as small as possible, the minuscule yet comfortable Sea to Summit Ultralight Sleeping Pad is a must have. The old adage of “light is right” applies particularly to objectives like the Pemi Loop. The simple and cleanly designed Black Diamond Speed 50 has just enough space for everything you need with no room for “extras,” keeping your kit pared down and you moving fast. After a full day on the trail, you’ll be ready to eat anything, but the last thing you’ll want to do is fiddle with a stove. The MSR Reactor is lightweight, packable, virtually unaffected by temperatures, and boils water quickly. And, don’t forget to pack a lighter. A sun shirt like the Black Diamond Alpenglow Sun Hoody is a perfect choice for hikes like the Pemi Loop, with extended, sun-exposed sections above the treeline. Quickly becoming a staple of our summer hiking kits, sun shirts provide simple UV protection, reduce the need for sunscreen and bug dope, and help keep you feeling fresh. A UV Buff is another excellent addition to any Pemi Loop gear list. It provides protection from the sun and wind on exposed ridges, and can double as a bandage in an emergency. The Pemi Loop is committing and bailing off it can be difficult if you only have one car. From both Garfield and Galehead, it’s possible to drop down to Thirteen Falls in the middle of the Pemi, and hike back to the Lincoln Woods Trail via the Franconia Brook Trail. That trail is another former railroad bed, so it is easygoing for the 10-plus miles back to your car. 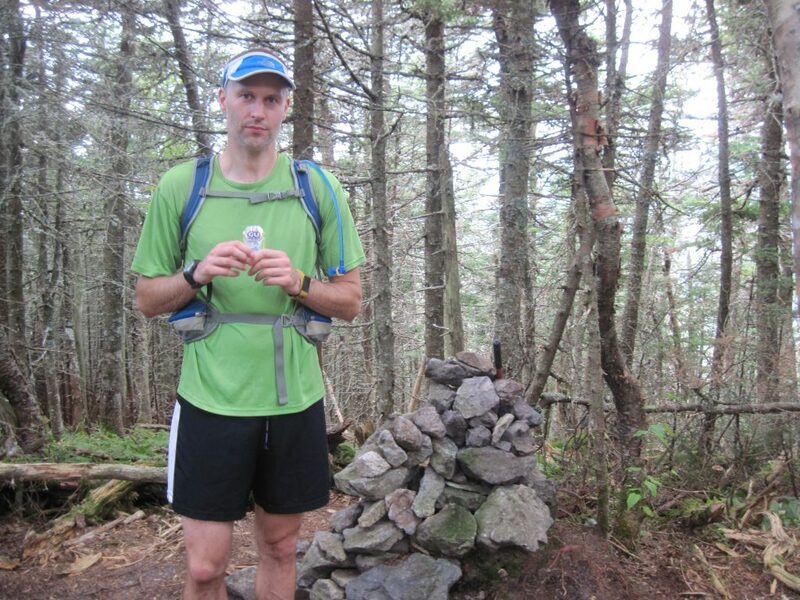 Although the Pemi Loop is an awesome goal and great accomplishment, you don’t have to do the whole thing in one go. Break it in two by using the Franconia Brook Trail. While it’s tempting to soak in the numerous incredible summit views, those doing the hike in two days will want to keep their breaks short, as the days are long to begin with. You’ll pass numerous streams on the Bondcliff Trail’s final descent and the East Pemigewasset River on the Wilderness Trail. Those ahead of schedule will love the chance to dip their feet in the cool, refreshing water. Although the Wilderness Trail can be the trip’s most tedious part, spend it marveling that it was once part of the White Mountains’ largest logging railroad system. We love Wayne’s Market in Woodstock for post-hike sandwiches. Pro tip: Call your order in at (603) 745-8819 as soon as you get cell service, so it’ll be ready and waiting for you. If you’ve spent a couple of hot days on the trail, Lady’s Bathtub in Lincoln and Crystal Cascade in Woodstock are great places to take a dip. Have you done the entire loop or even a piece of it recently? Post your experience and the trail conditions (with the date of your hike) in the comments for others! Staying fueled up for a hike requires much more than just taking enough snacks. Rather, it’s something that starts before you even leave your house and doesn’t end until you’re back safe, completely refueled from all that exercise. Eating before you’re hungry and drinking before you’re thirsty are important parts of keeping your energy up while you’re climbing hard, but that can mean several different things. While there’s no 100-percent “right” way, a few key principles will keep you feeling strong, even on your longest days. The first key to fueling your quest begins before you leave. If you’re like most people and have a long drive to the trailhead, use that time to get a jump on the day’s calories and hydration. If you have an unusually long day ahead, you might want to start even before you get into the car with something simple, like oatmeal, cereal, or a bagel. Depending on how far you have to travel, your arrival at the trailhead might be closer to lunch than breakfast. Whether it’s a breakfast sandwich from the local coffee shop, a pastry (or two), the classic peanut butter and jelly, or even leftover pizza, get something in your stomach, and give it a chance to digest before pulling into the trailhead parking lot. Remember that it’s significantly lighter and easier to leave the trailhead with a full stomach and a bottle of water in your belly, instead of carrying them in your pack. It’s also worth noting that if you have to drink coffee in the morning, caffeine—in addition to being a performance enhancer—is a diuretic. 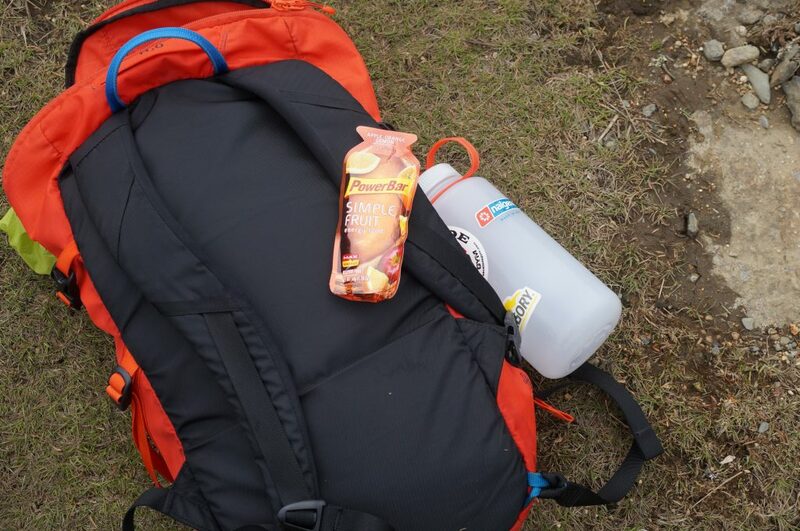 Although coffee is perfect for getting to the trailhead, it also leaves you slightly dehydrated, so plan accordingly. 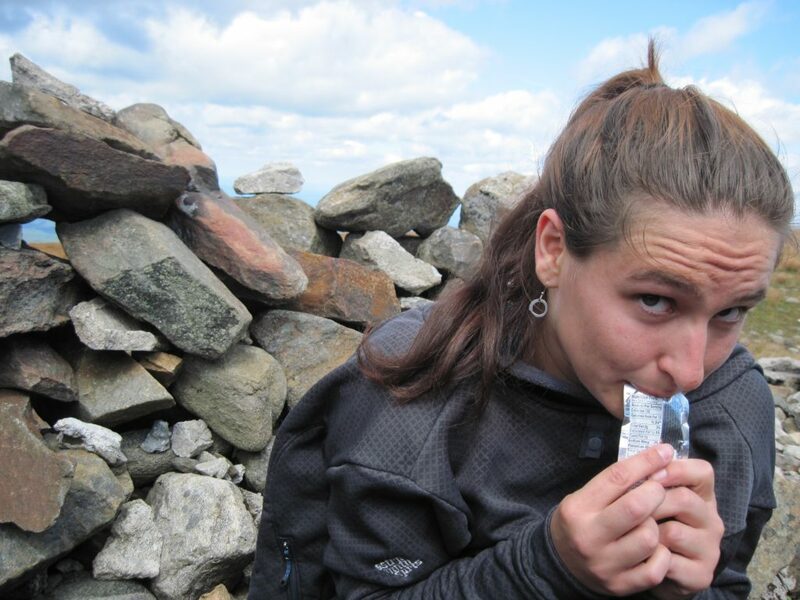 While you hike, a good rule of thumb is to consume between 100 and 150 calories per hour. For fast-paced activities, energy bars and gels are a great way to get the calories you need while on the go. When a fast pace intersects with a long distance, however, something simple, like peanut butter and jelly, honey, or Nutella sandwiches, is a great way to celebrate a summit (or break) and provides an excellent “real food” alternative to supplement bars, gels, and chews. For more moderate-paced outings, “real” food is the way to go. While the more traditional among us will reach for either store-bought or homemade GORP, cookies, Goldfish, and tortilla chips are all hiking favorites as well. Also, sandwiches, leftover pizza, and quesadillas all pack easily and will make you the envy of your fellow hikers. The thing to remember here is that personal preferences vary, and you should bring food that you will actually want to eat—not have to force down. Lastly, it’s a good idea to pack some extra food in case of an emergency. Stash a couple of highly caffeinated gels in your pack, just in case somebody bonks. There’s one in every group, and these always seem to work to get them up and moving again. When it comes to staying hydrated on hikes that just take a few hours, one 32-ounce bottle will suffice. For hikes longer than 10 miles, trail runs, and traverses, two 32-ounce bottles or a two-liter hydration bladder does the trick. If it’s really hot out or the distance is huge, you can always add a bike bottle. Using a GU or Nuun hydration tab in your bottles not only adds a little taste but also helps replace electrolytes lost primarily through sweat. For longer outings, it can be nice to carry an extra hydration tab if you’ll be refilling at a stream or hut. For the “camels” among us (and the coffee drinkers who arrive a little dehydrated), moving from a traditional 32-ounce bottle to a Nalgene Silo is an easy way to pack a bit more liquid without a significant weight penalty. Another thing to consider is the use of bottles versus a hydration bladder. Although a hydration bladder is incredibly convenient, it’s easier to keep tabs on how much you’re drinking during the day using bottles. No matter if you brought a full-course meal or subsisted off gels, there is something special about eating when you come back from the mountains. It also helps your recovery to have a meal 30 to 45 minutes after you finish hiking. Moreover, after a long day along the trails, you’re usually ready for something more substantial than the typical hiking fare. The key here is to start replacing all of the calories you burned over the course of the day. A simple way to ensure you’re getting enough is to pack a post-hike meal to have at the campsite or on the car ride home. Did you plan a last-minute trip or didn’t think that far ahead? No worries—just head out to eat. But, beware: It’s amazing how much you can spend on the “value” menu after a long day in the mountains. 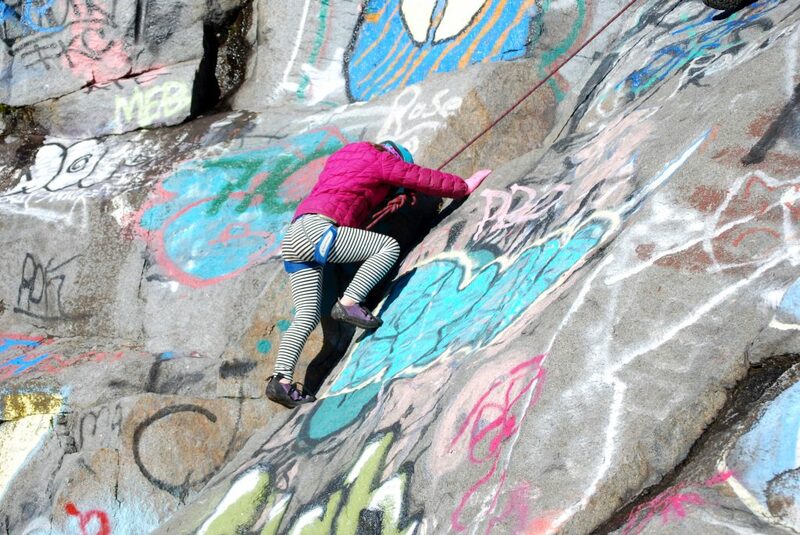 Rock climbing is great for children. It gets them outside, it teaches problem solving, communication, and trust, and most importantly, it offers them an outlet to expend their infinite energy reserves. For all these reasons, you should consider taking them with you the next time you head off to climb outdoors. At the same time, a trip to the local crag becomes a bit more complicated when you add child-climbers into the mix. 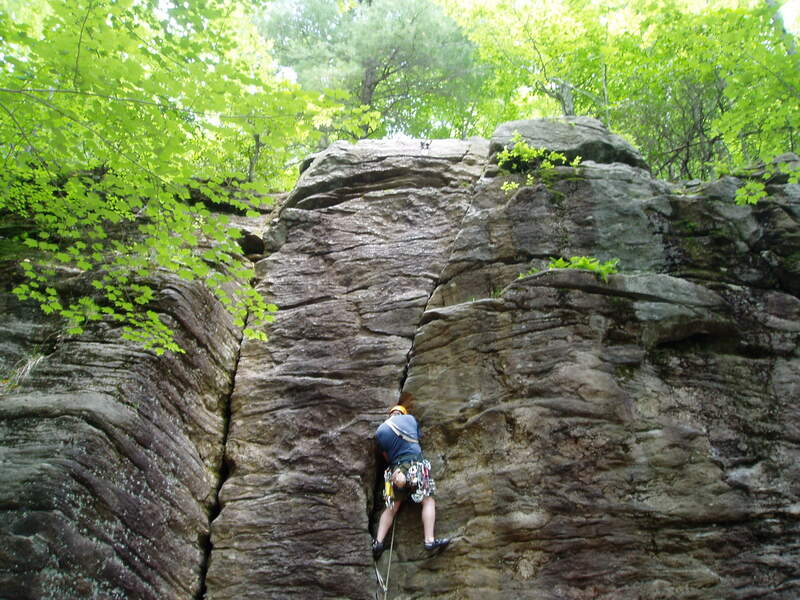 So, to prepare, here are nine tips to keep cragging with the kiddos fun and safe for everyone. Kid-friendly, top-roping crags typically have three things in common. First, there is an easy and short approach with no objective hazards. Second, the staging area at the base of the climb—where you’ll be spending the next couple of hours belaying and hanging out—is flat and safe. Third, the routes should be easy (between 5.0 to 5.5) and less than vertical, and should have smooth landings, in case they have trouble with the first few moves. If you’re in the Boston area, the most concentrated selection of beginner climbs is on the Main Wall at Chestnut Hill’s Hammond Pond. 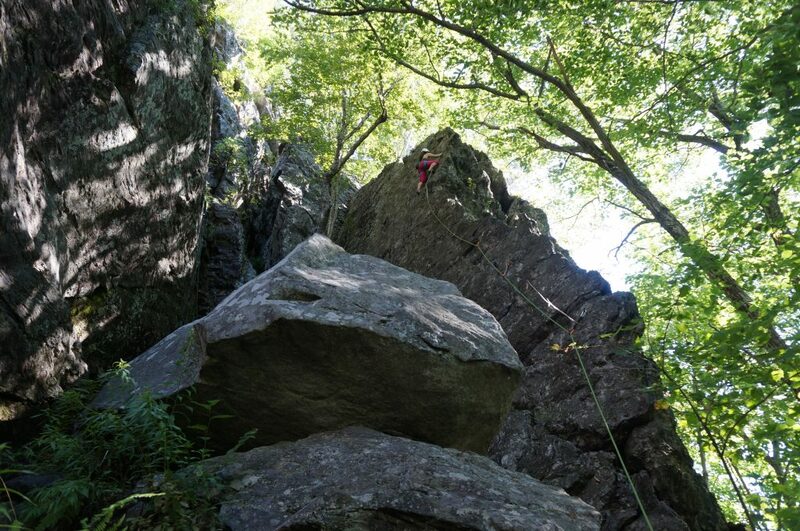 The best route, an alcove at the far-left end, is a fun, easy climb that everybody can do. 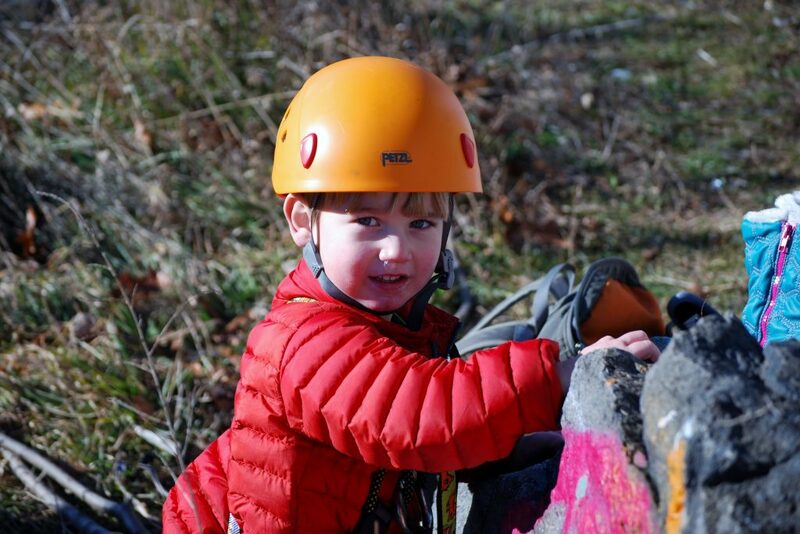 Kids need two pieces of equipment to climb safely: a harness and a climbing-specific helmet. Climbing shoes are not essential, but their sticky rubber soles do make things easier. For children younger than 6 or 7, a full-body harness is recommended. These harnesses have a tie-in point at chest-level and are designed to prevent kids from falling out if they flip upside down. Climbing does not come easily for every kid. 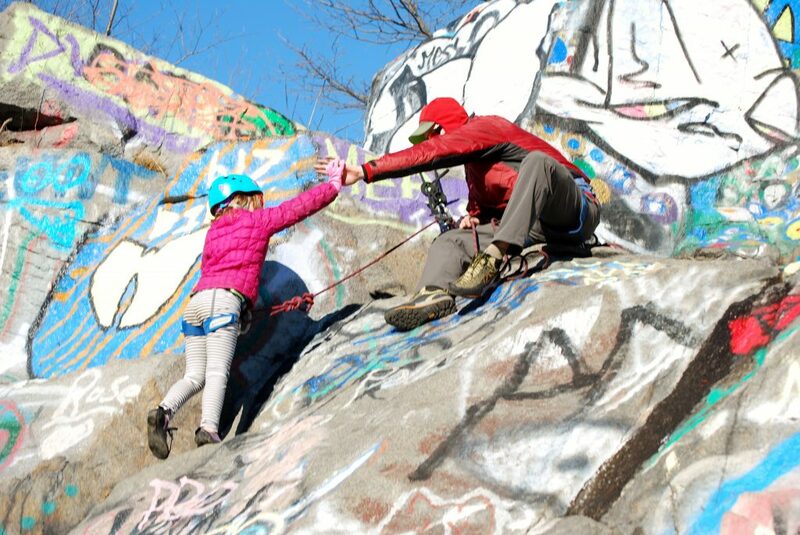 If your kiddo is struggling at a specific move low on the route, one simple technique that helps build confidence is the “foot-spot.” Just use your hand to stabilize her foot on the hold, so that she can climb through the difficulty to easier terrain. If her crux is out of your reach, consider having the belayer take a little extra weight as the climber attempts the move. This extra “pull” is often enough to assist a child through the move and allows him or her to finish the climb. 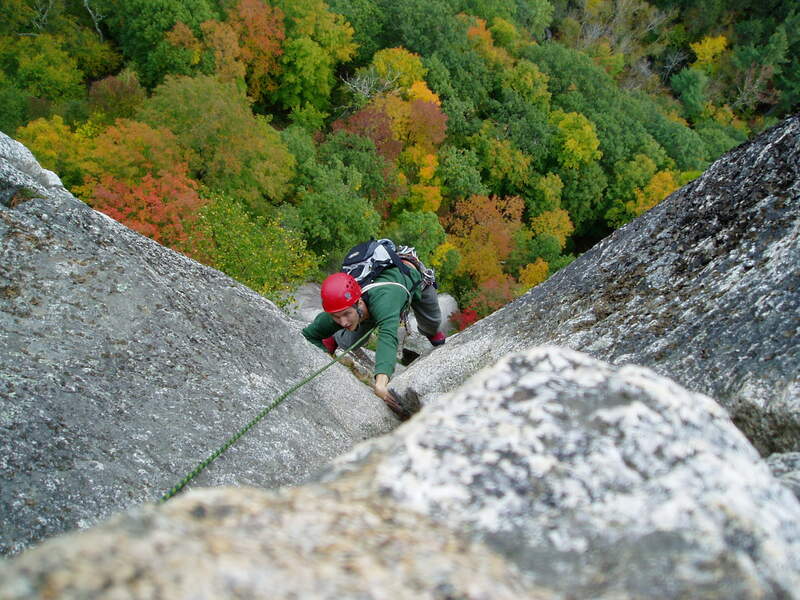 First-time climbers often struggle with transitioning to being lowered after they get to the top of the climb. So, before your kid leaves the ground, rehearse what will happen once she reaches the top. Kids are much more likely to “trust the rope” if you’ve had them climb up about six to seven feet and then do a practice lower. Moreover, it’s much easier to correct their body position for lowering when they are within arm’s reach than when they are swinging nervously at the top! Bring a variety of small snacks for the kids after their “sends.” They help keep the energy levels high and usually provide enough distraction for the break between climbs. If you are planning on climbing with a couple of kids, consider bringing toys and games to keep them busy and engaged throughout the outing. For example, we always bring my younger son’s toy trucks when we go climbing as a family. He’s only three, so his attention span for climbing can be quite short. But, he’s always happy to hang around and fill his dump truck with dirt while the rest of us get in a couple more top-rope laps. 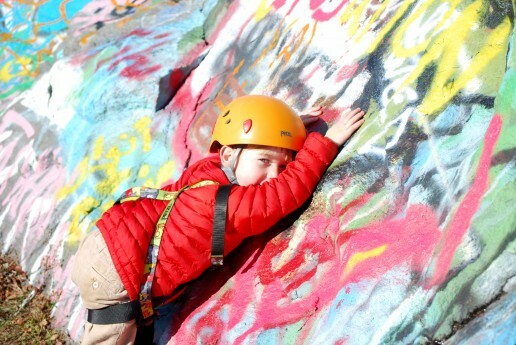 Kids, especially young ones, require a lot of attention when climbing. Set expectations by articulating clear rules, particularly about edge safety. And, when climbing with several kids, having a second adult, who supervises the non-climbing children so the belayer can avoid distractions, keeps the focus solely on the climber’s safety. When you head out to climb with your family, try not to get carried away with your own “sending” ambitions. Your project is probably too hard for your kids, and they’ll get bored—and want to go home—if they have to watch you work it for too long. Try instead to get your climbing fix either on the route they’re climbing or on an adjacent one. Despite your best efforts, sometimes the climbing is too crowded, the route is too hard, or your little climber just isn’t into it. To avoid a total loss, have a backup plan. Scrambling on a nearby easy boulder problem is often a good alternative. A quick hike or nature walk is another option. Climbing is dangerous. 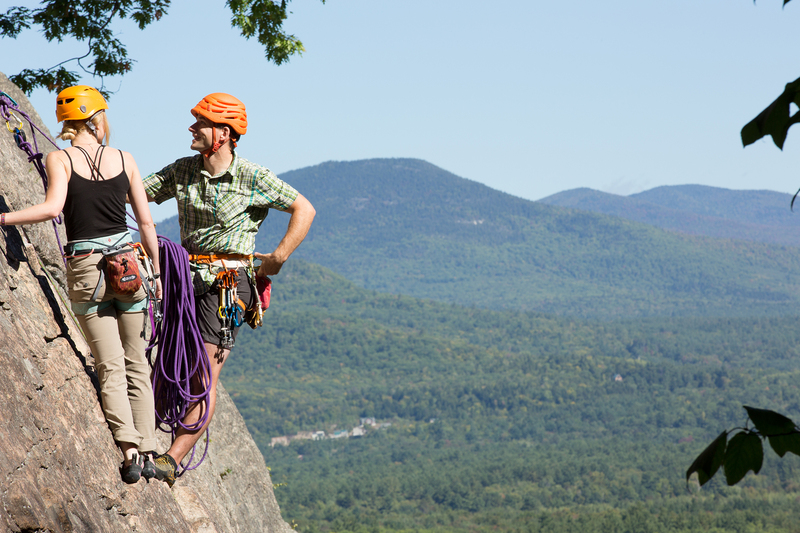 If you are interested in climbing with your family, but don’t feel confident doing it yourself, sign up for a lesson with the Eastern Mountain Sports Climbing School. 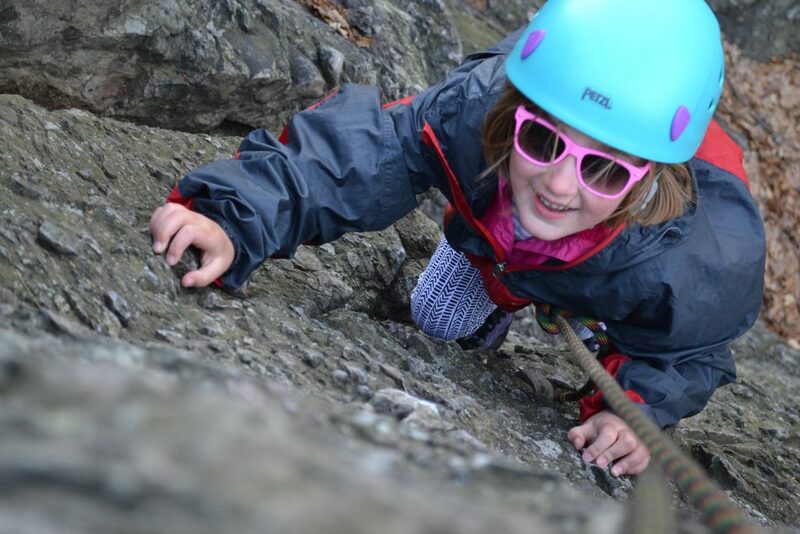 Can you think of any other tips for rock climbing with kids? Share them here in the comments section!